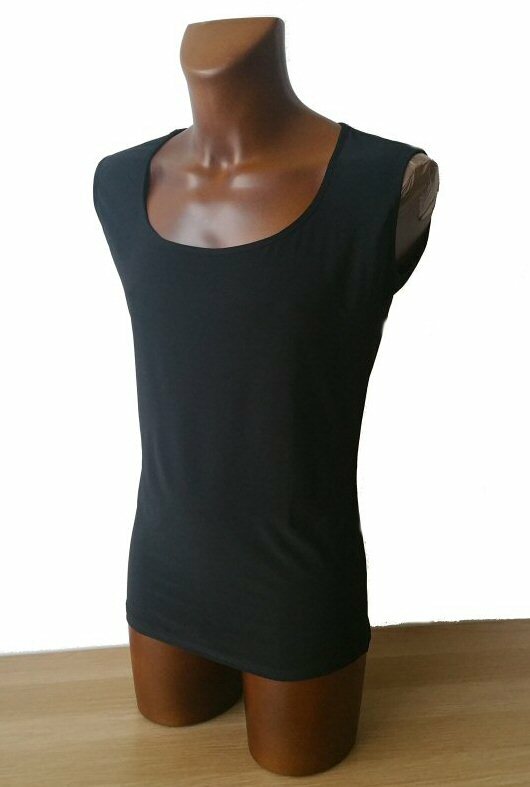 This vest can be worn inside or outside your trousers. Made in stretch crepe. The sizes are given below when the fabric is completely unstretched. Every size will stretch by up to 1 inch. 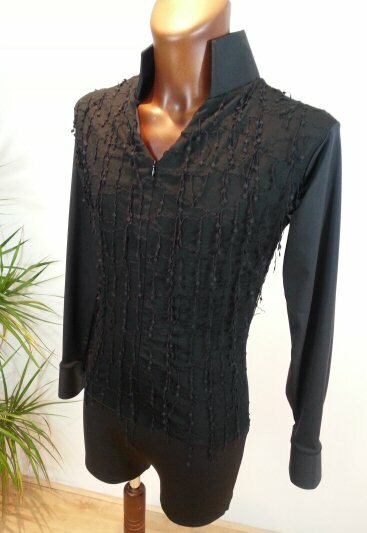 We can also make this shirt in Custom size for £10 surcharge. Being built on boxer shorts, this vest will never pull out from your trousers. Made in stretch crepe. 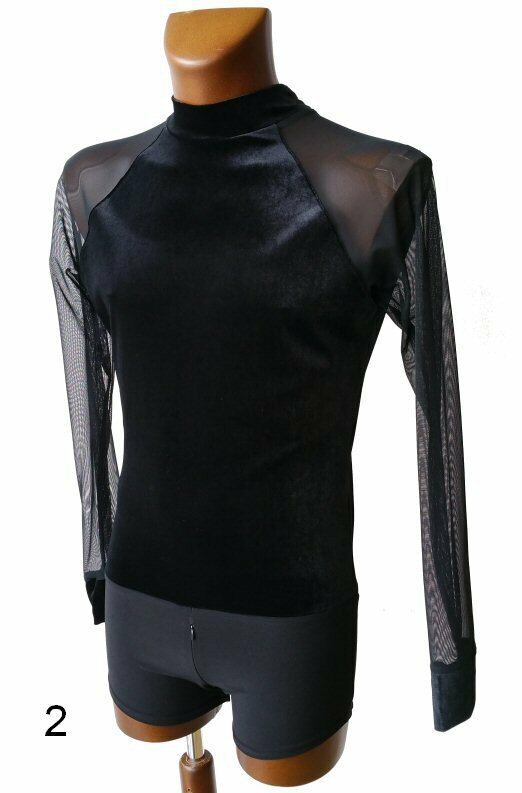 By not having any buttons and staying open, this mesh shirt is designed to fly as you dance. The two halves of the front side will not meet completely to avoid having too much flying material in front of you. 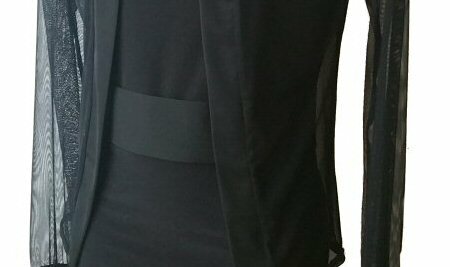 This wide, elasticated belt makes a nice addition to the mesh shirt and can be added to the outfit regardles if you wear the vest inside or outside your pants. The belt is secured with velcro on the back. 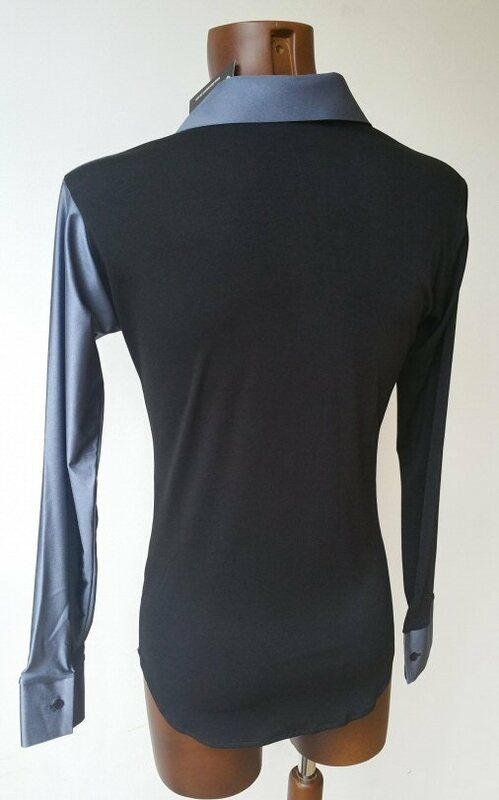 This is a body shirt built on boxer shorts, so it will never pull out from your trousers. Vertical lines symmetrically placed on both sides on the front. Plain back. Double cuffs. Traditional collar. Collar size goes in proportion with the body size. 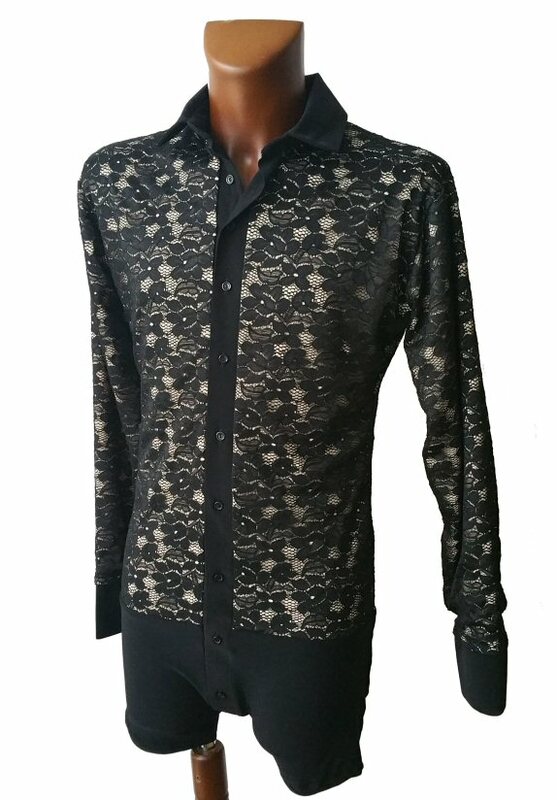 This is a classic version of this shirt that can be worn outside trousers. Vertical lines symmetrically placed on both sides on the front. Plain back. Double cuffs. Traditional collar. Collar size goes in proportion with the body size. This is a full body version of this shirt built on shorts. Lace over tan underlay is symmetrically placed on both sides on the front. Plain back. Double cuffs. 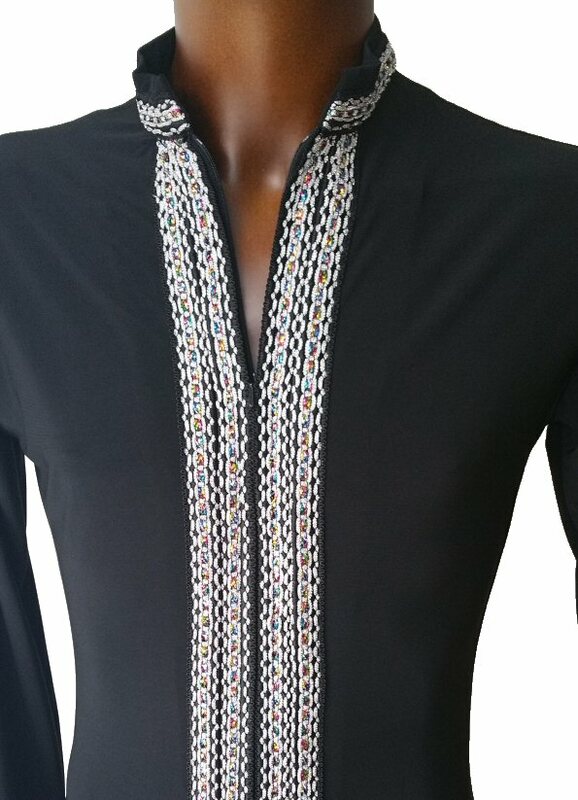 Traditional collar. Collar size goes in proportion with the body size. 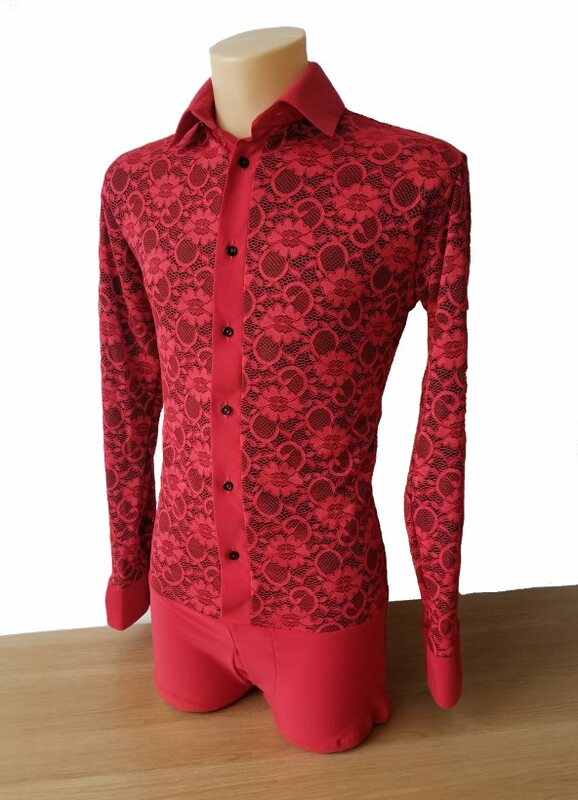 This is a classic version of this shirt which can be worn outside trousers. 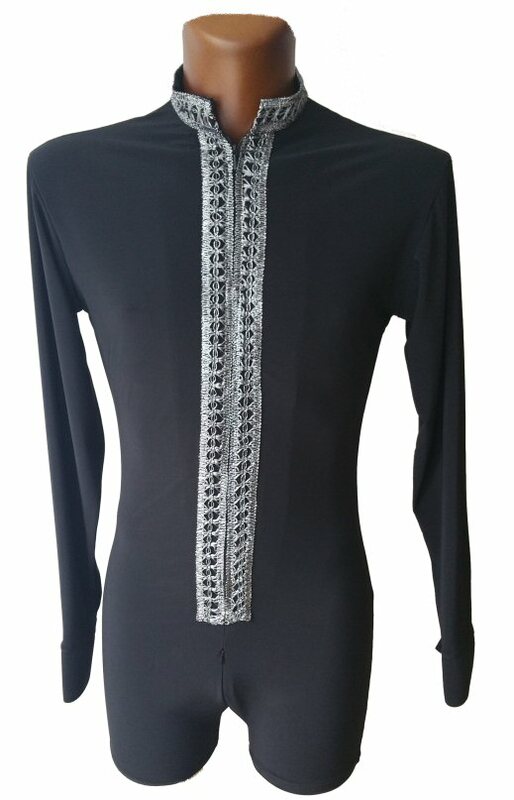 Metalic looking fabric symmetrically placed on both sides on the front. Plain back. Double cuffs. 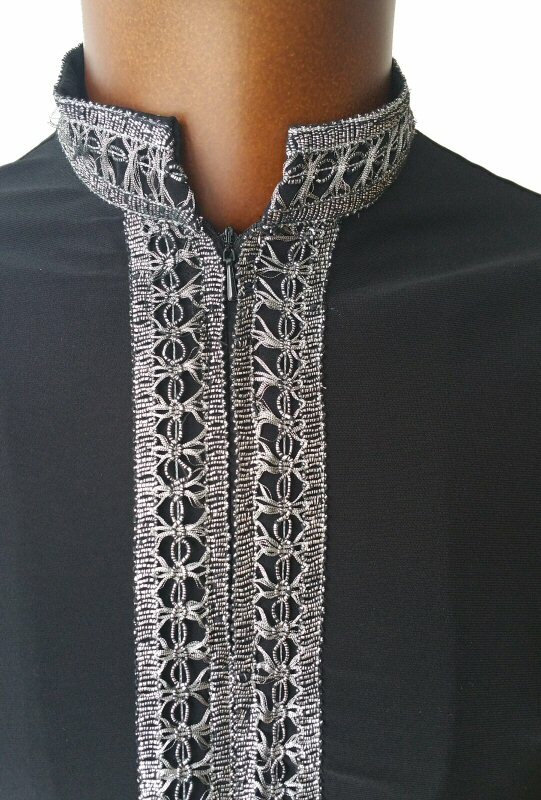 Traditional collar. Collar size goes in proportion with the body size. 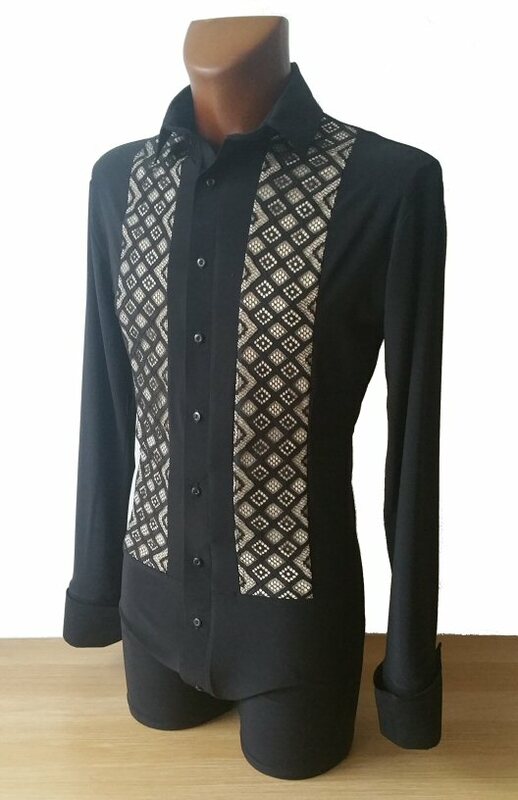 This is a classic version of this shirt which can be worn outside trousers. Spider web style fabric symmetrically placed on both sides on the front. Plain back. Double cuffs. Traditional collar. Collar size goes in proportion with the body size. 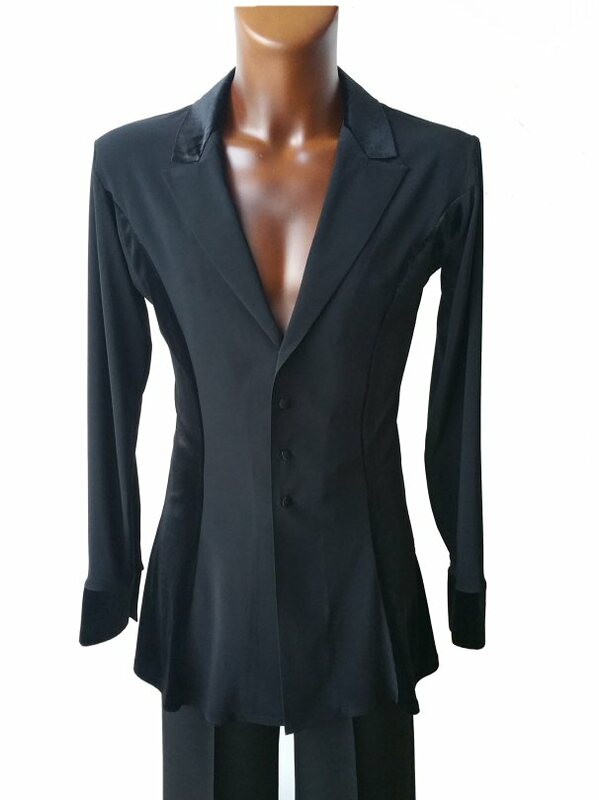 Jacket style Shirt gives you a smart look like a jacket and is light to wear like a shirt. 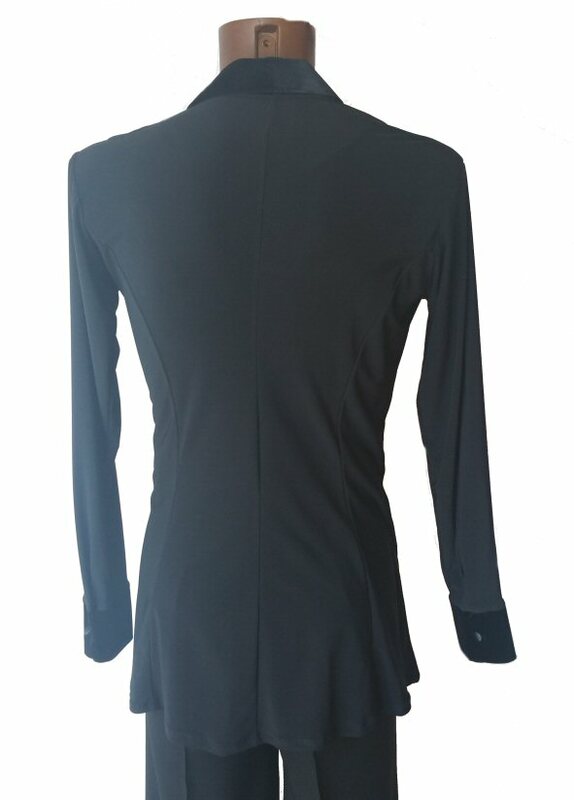 Made in stretch crepe it easily adjustable to your body moves. Straight hem with two small slits on sides. 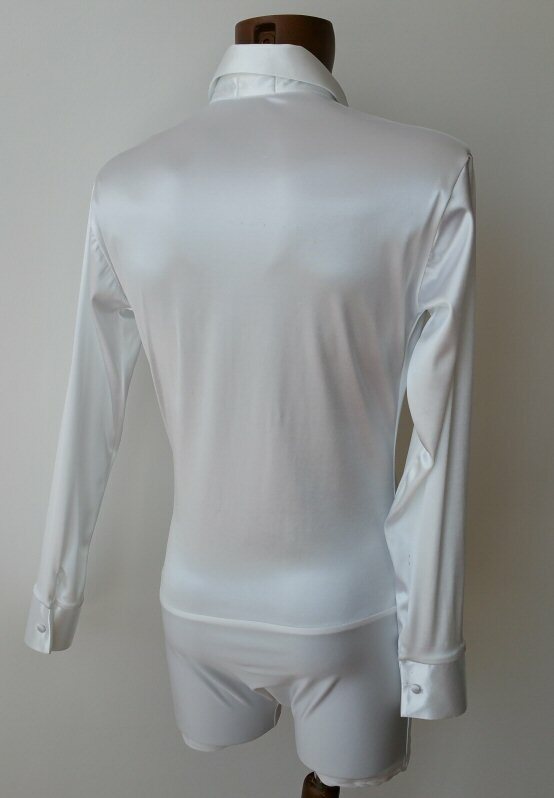 The collar and cuffs are finished with high quality satin. 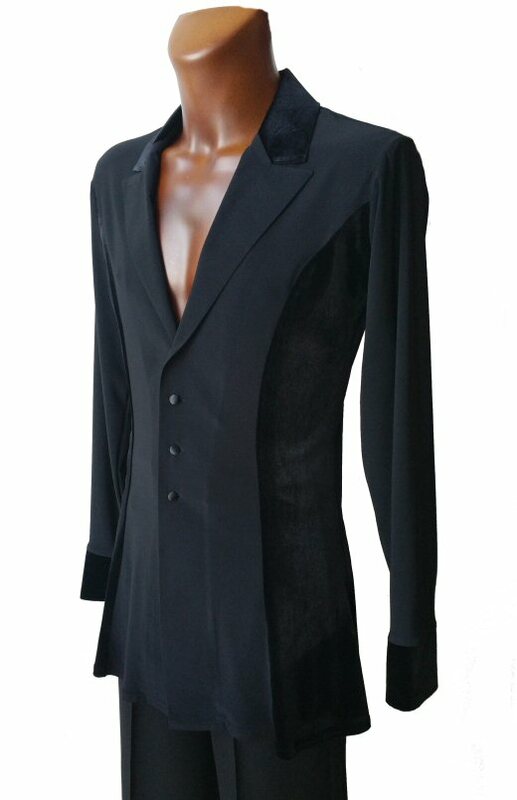 Satin covered buttons complete the perfect look. Machine washable. The plain stretch crepe is suitable for stoning for your performance. Jacket style Shirt gives you a smart look like a jacket and is light to wear like a shirt. 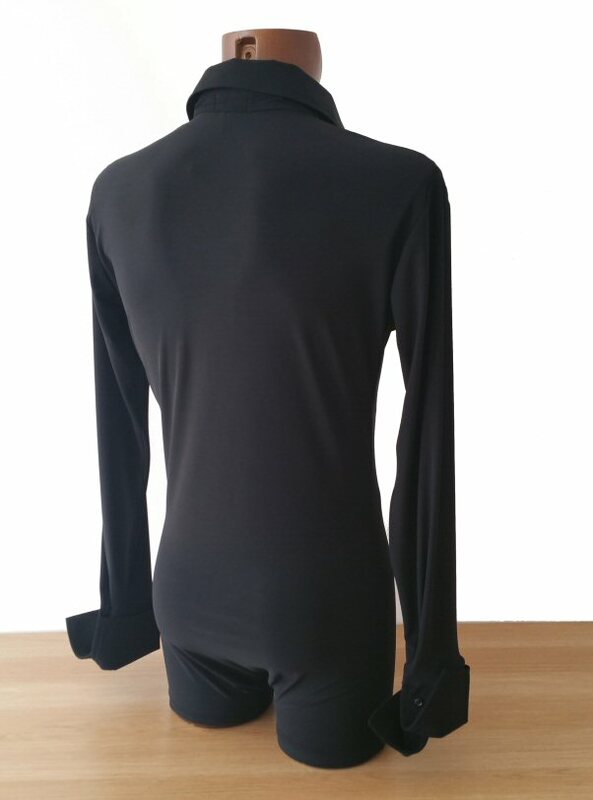 Made in stretch crepe it easily adjustable to your body moves. 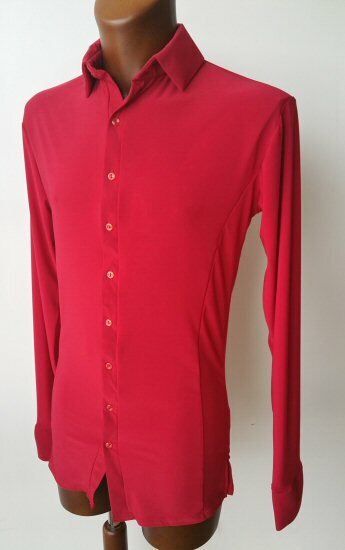 Straight hem with two small slits on sides. 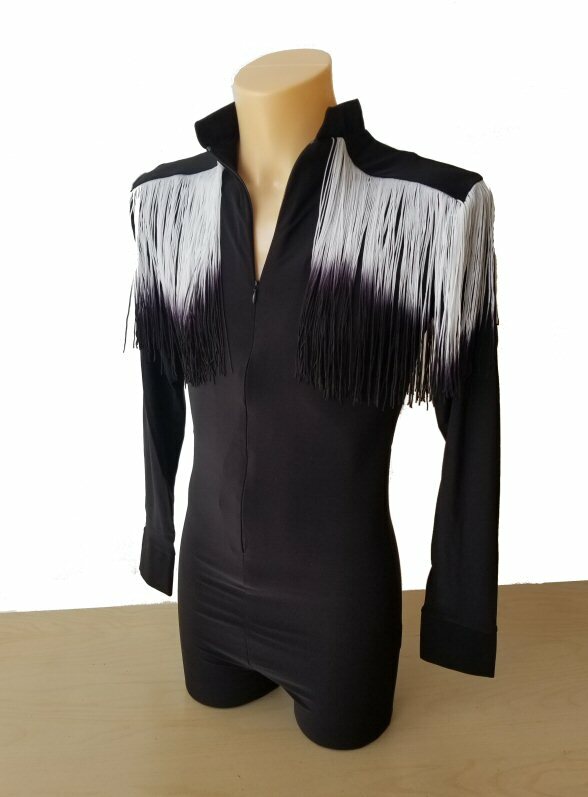 The collar and cuffs are finished with high quality velvet. Satin covered buttons complete the perfect look. Jacket style Shirt gives you a smart look like a jacket and is light to wear like a shirt. 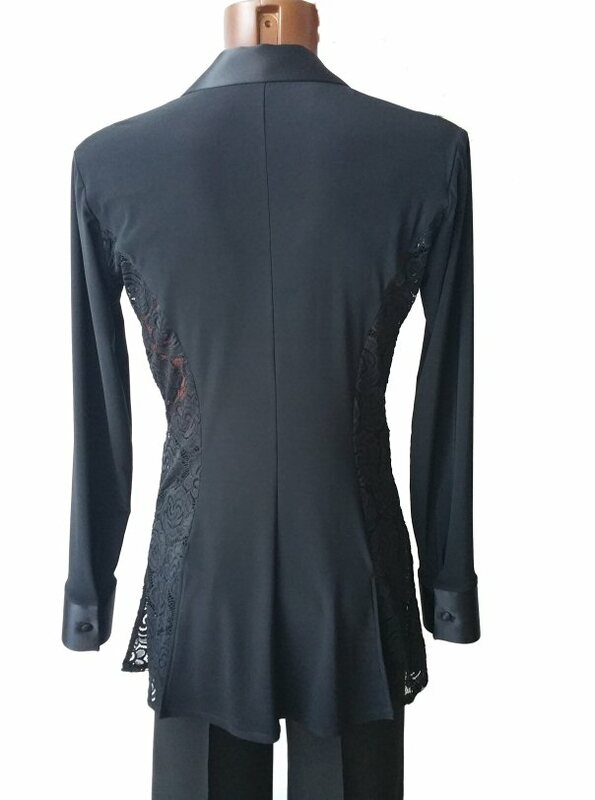 Made in stretch crepe and stretchy light reflecting slightly sparkling fabric makes it easily adjustable to your body moves. 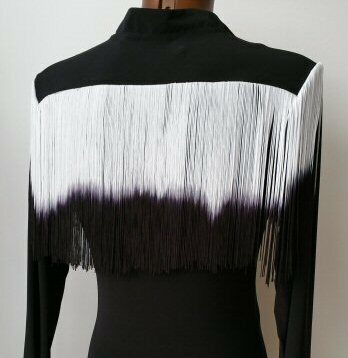 Flared hem line with slits allows the hem to move freely as you spin adding impact to your moves. The collar and cuffs are finished with high quality satin. 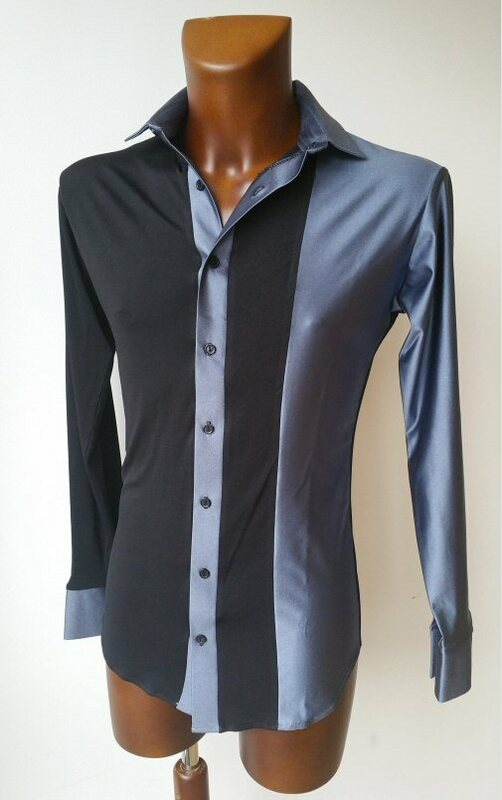 Satin covered buttons complete the perfect look. 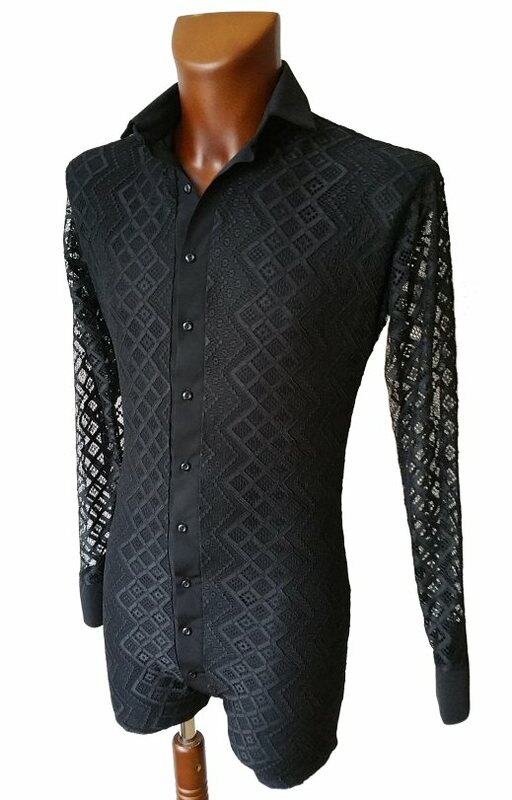 This Jacket style Shirt is more contemporary design than the above, but it also gives you a very smart look and is light to wear like a shirt. 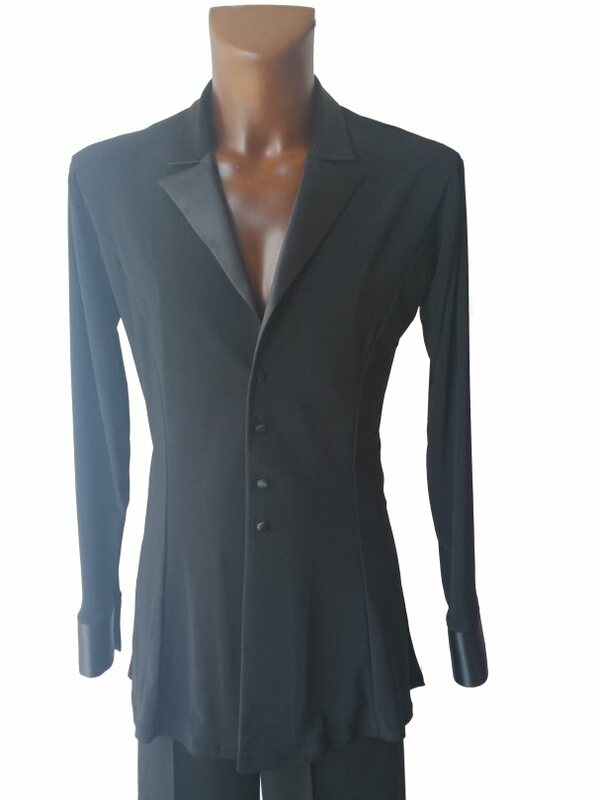 Made in stretch crepe with high quality satin edging it easily adjusts to your body moves. 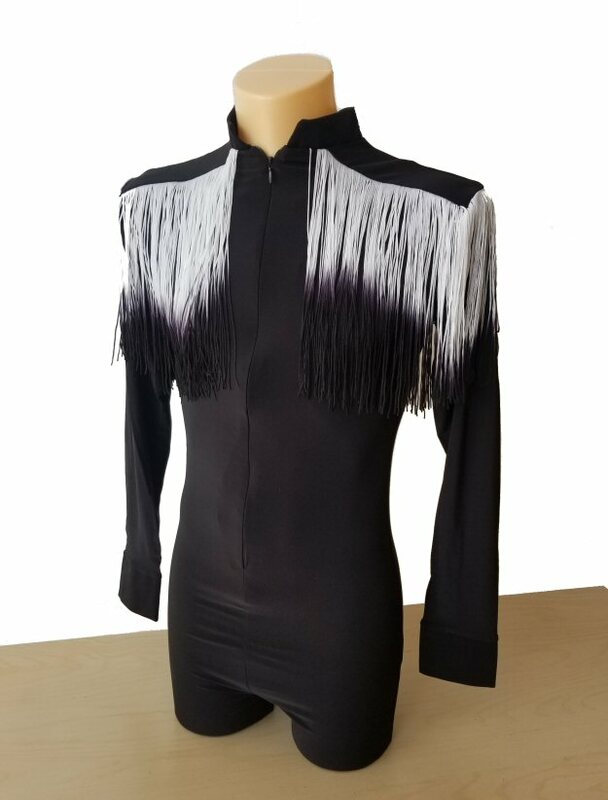 Flared hem line with slits allows the hem to move freely as you spin adding impact to your moves. The collar and cuffs are finished with high quality satin. 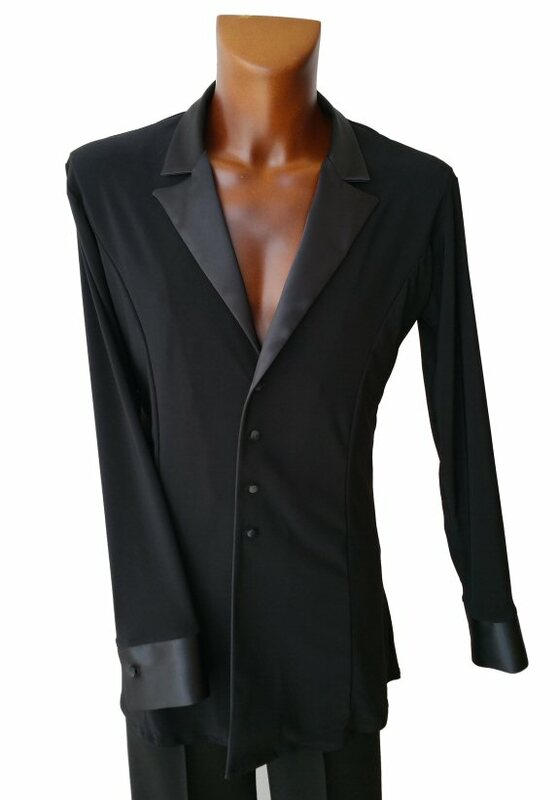 Satin covered buttons and detachable satin back detail complete the perfect look. 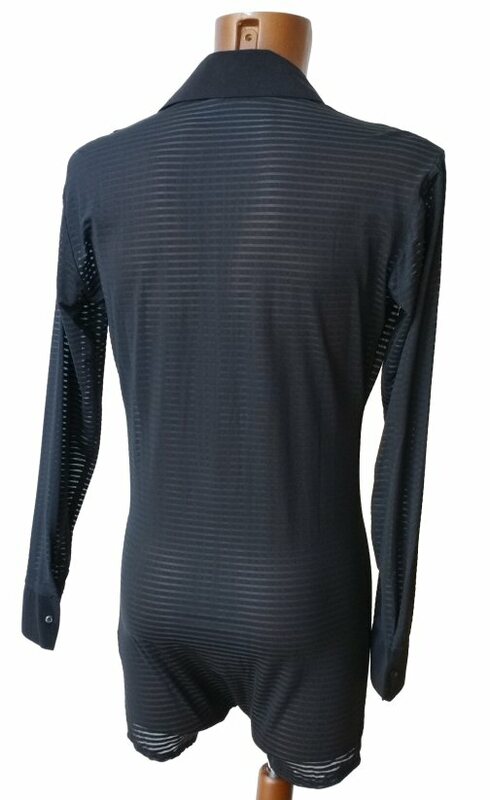 Full body shirt built on shorts with Raglan style mesh sleeves. Machine washable. 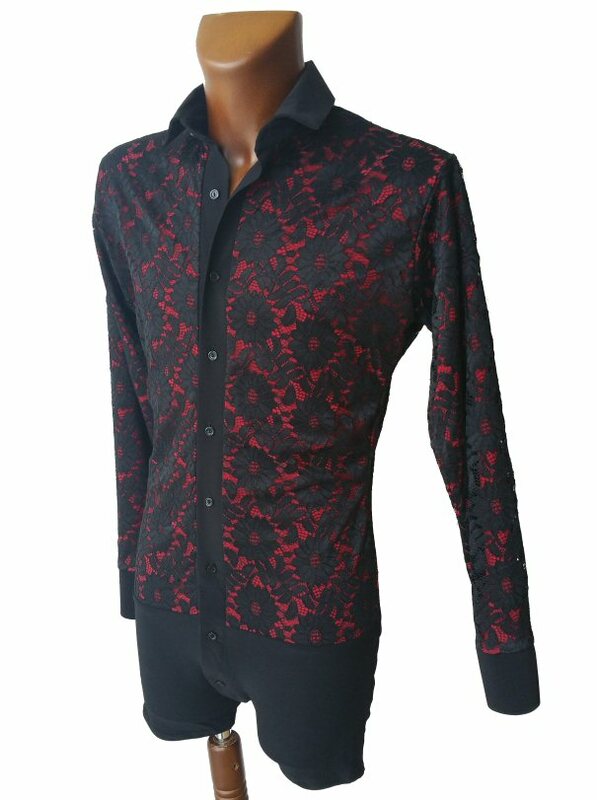 This body shirt is available in six different types of fabric on the front and back. The plain stretch crepe (version 1) is suitable for stoning. 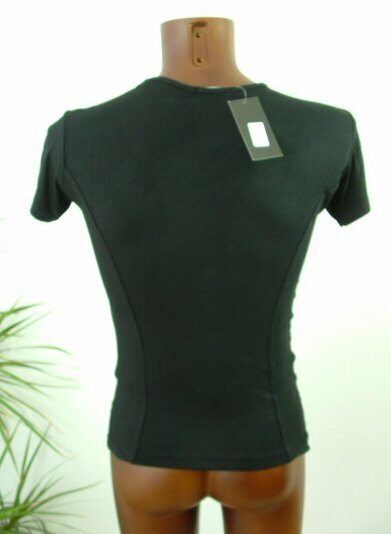 Some shirts have been made with a zip in the fly and some without. Select which version you prefer. 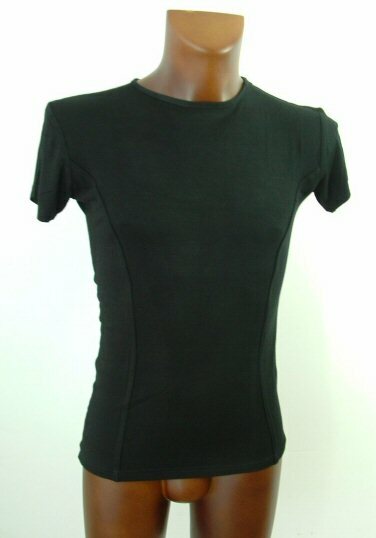 This is a body shirt built on shorts with zip and unique Silver circles motiv on black tape around the neck and front line. Machine washable. 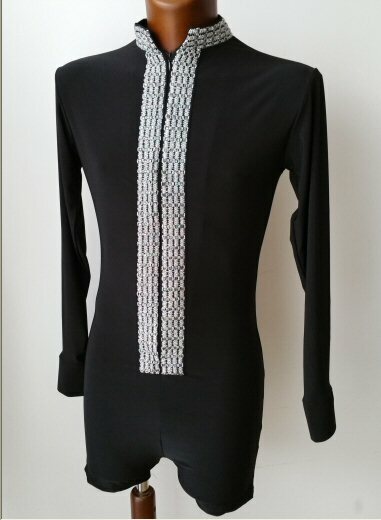 This is a body shirt built on shorts with zip and unique plaited sequin motiv around the front. Hand wash. 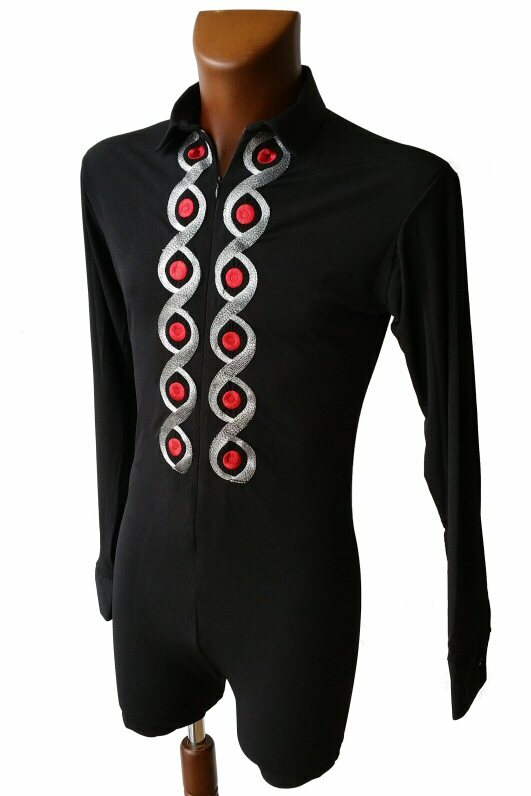 This is a body shirt built on shorts with collar, zip and unique Silver/Red motiv around the front line. Machine washable. 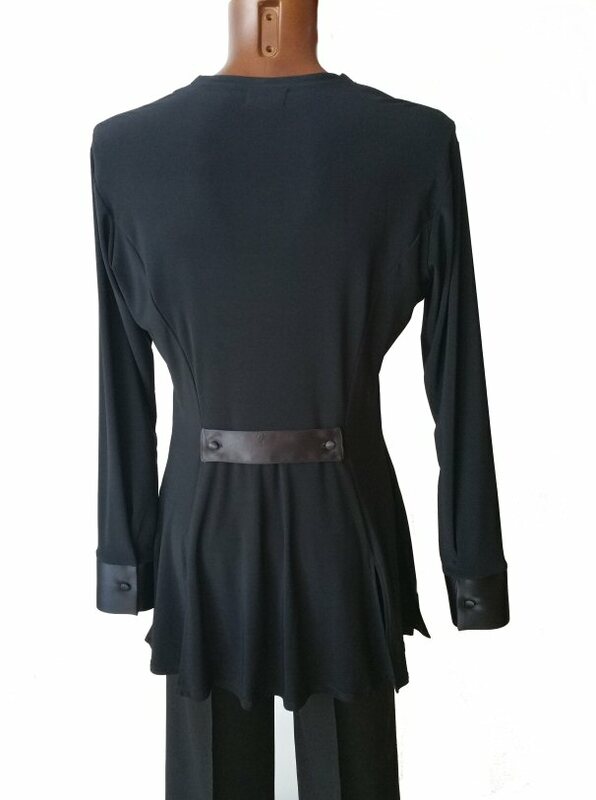 Soft, two way stretch crepe shirt with buttons and collar. 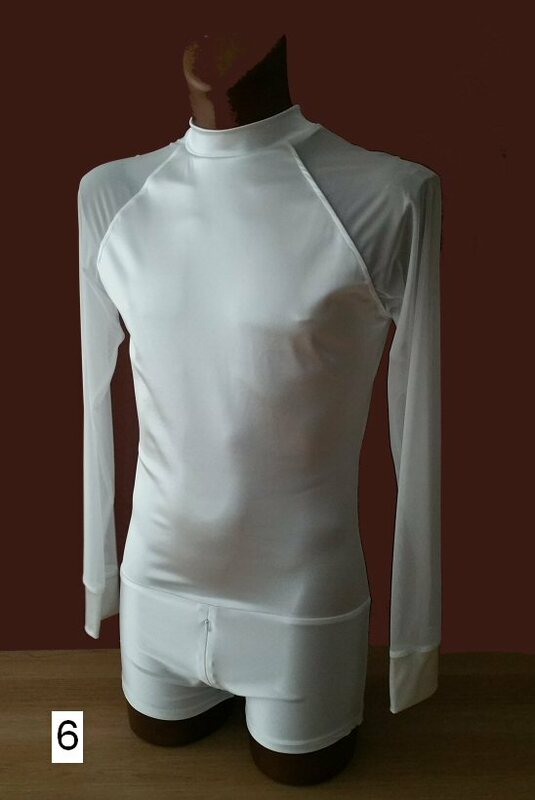 This is a shirt only, with no underpants. It can be worn outside your trousers. 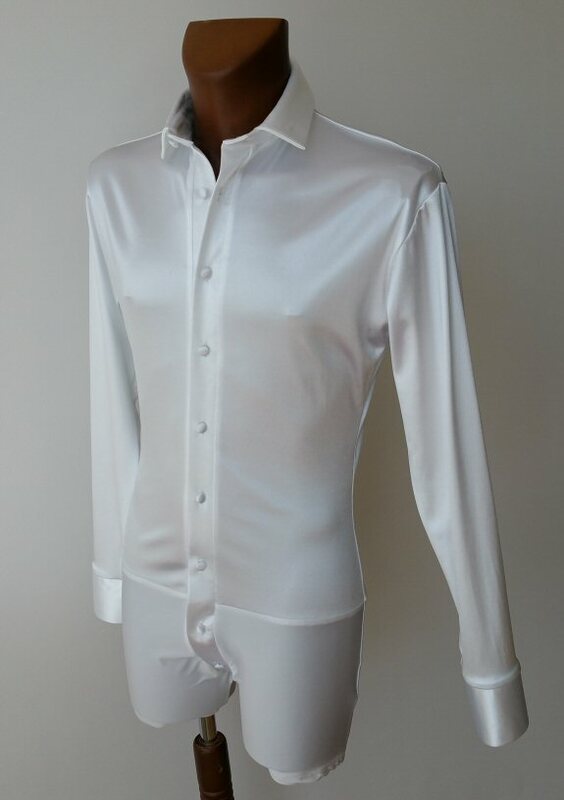 Stretch satin shirt with buttons and collar. 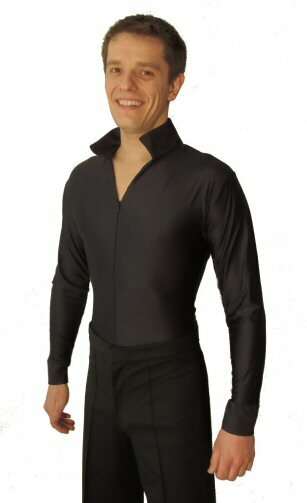 This is a full body shirt built on shorts, so it will never pull out from your trousers. Satin covered buttons. 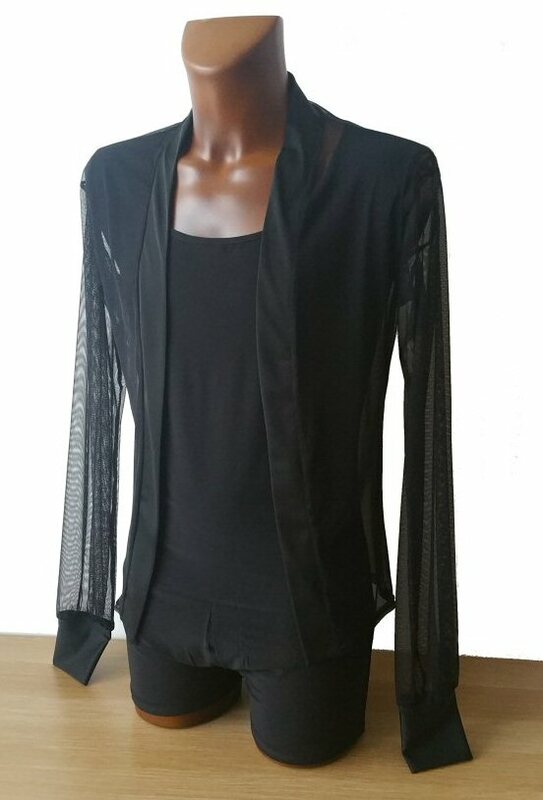 Very soft and stretchy luxury crepe. 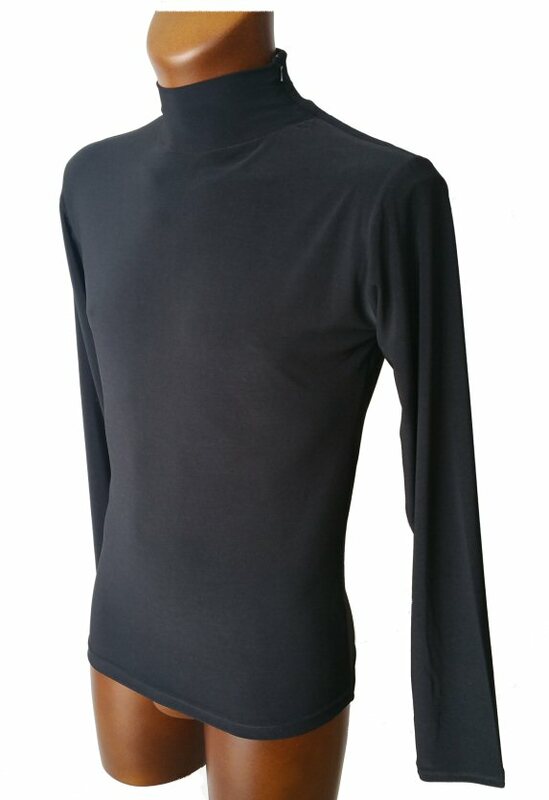 Very soft and stretchy luxury crepe. 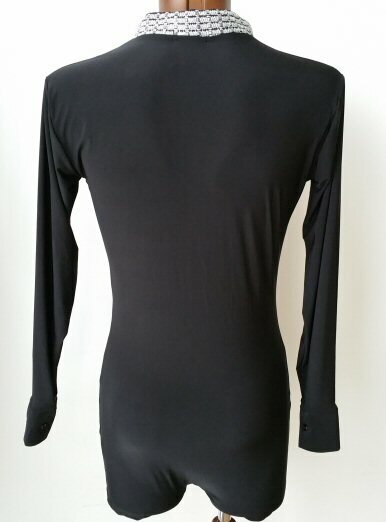 This polo neck top has a Zip on shoulder, which you can open or close. This is a shirt only, no underpants. 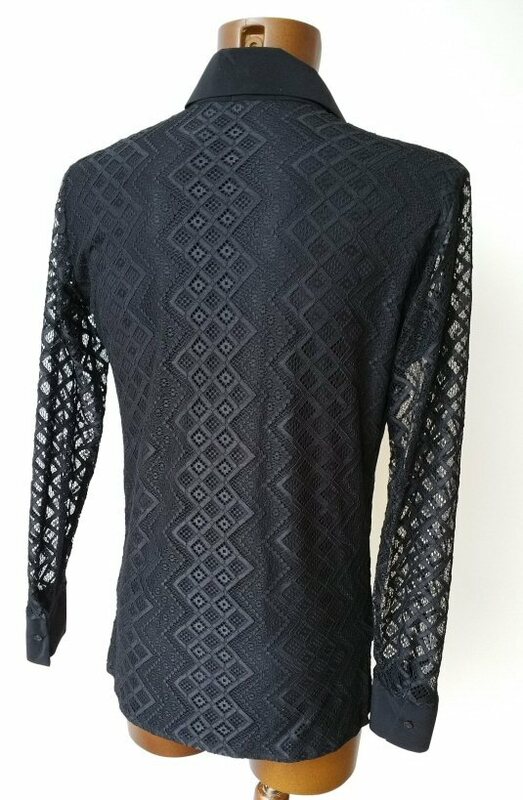 Square design lace pattern over plain black underlay on front and back. 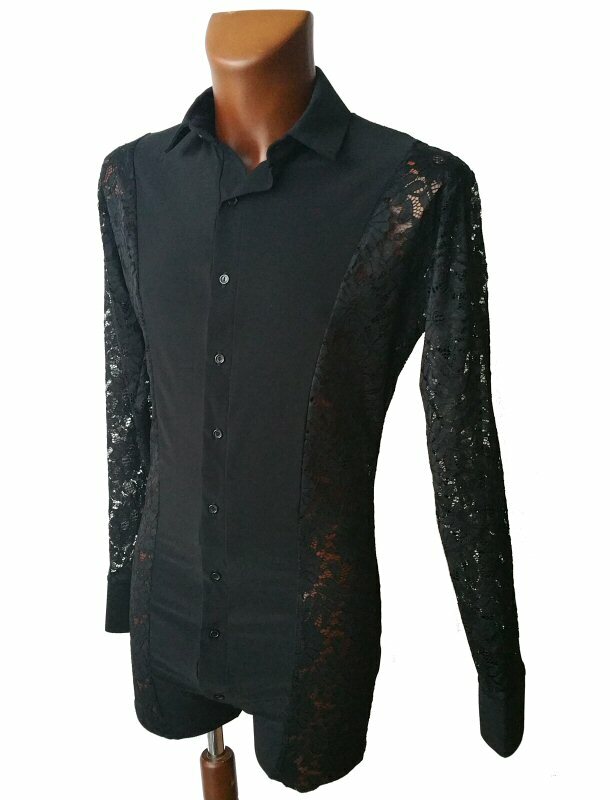 Lace only on sleeves. Traditional collar and cuffs. Collar size changes in proportion with the body size. 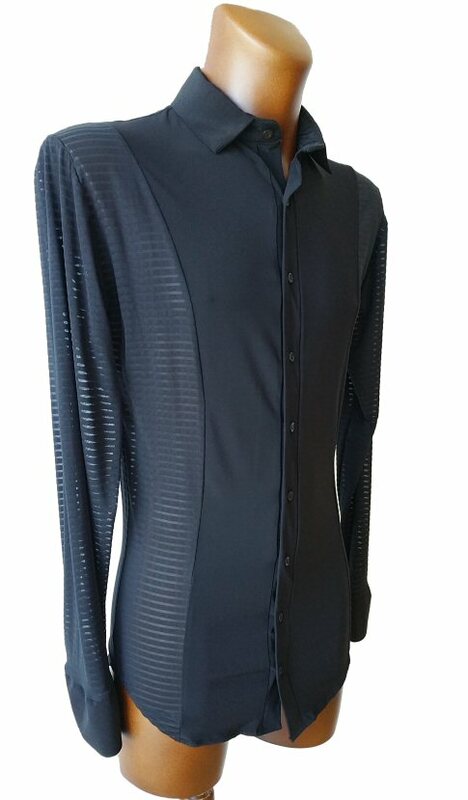 This is a body shirt built on boxer shorts, so it will never pull out of your trousers. 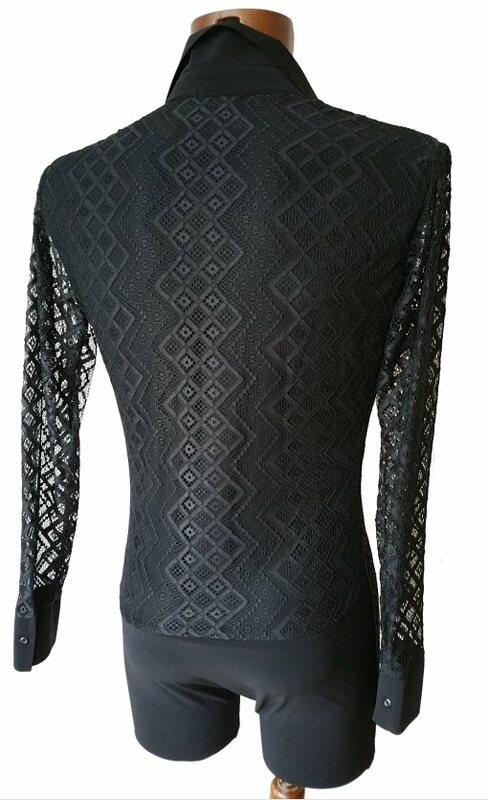 Square design lace pattern over plain black underlay on front and back. 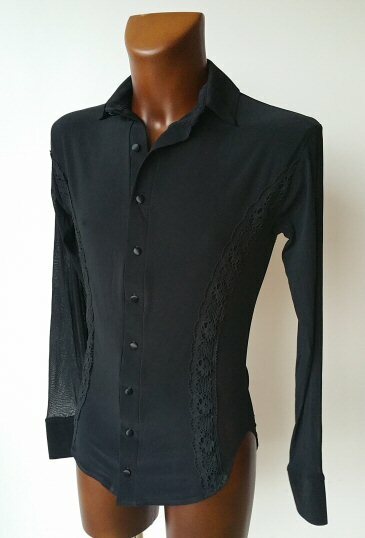 Lace only on sleeves. Traditional collar and cuffs. Collar size goes in proportion with the body size. This is a body shirt built on boxer shorts, so it will never pull out of your trousers. 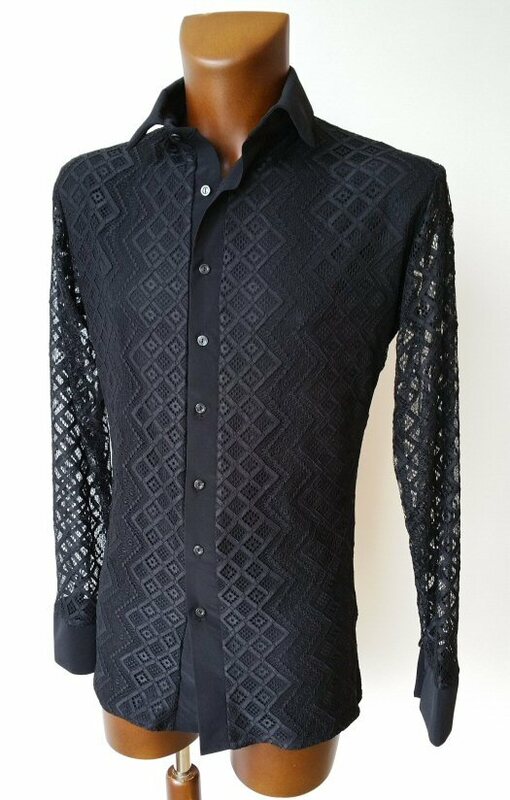 Square design lace pattern over plain black underlay on front and back. Traditional collar and cuffs. Collar size goes in proportion with the body size. This is a body shirt built on boxer shorts, so it will never pull out of your trousers. 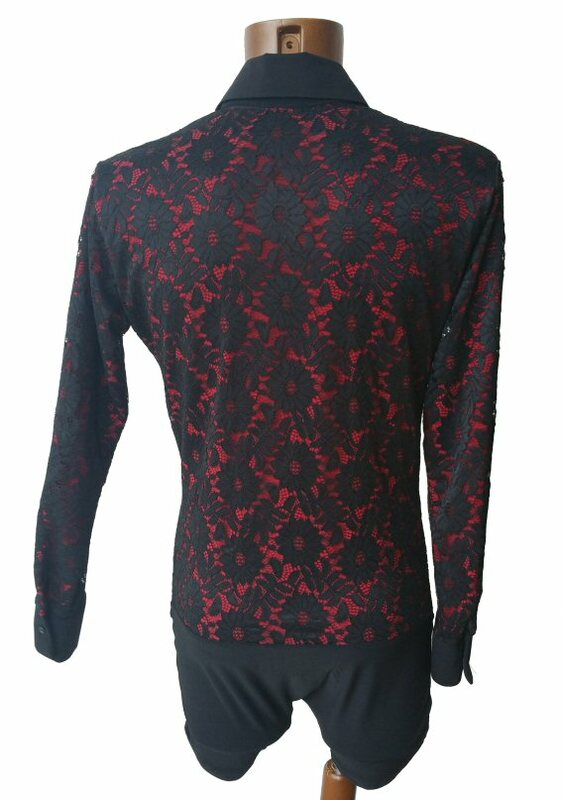 Black lace over red underlay on front and back. Traditional collar and cuffs. Collar size goes in proportion with the body size. This is a body shirt built on boxer shorts, so it will never pull out of your trousers. 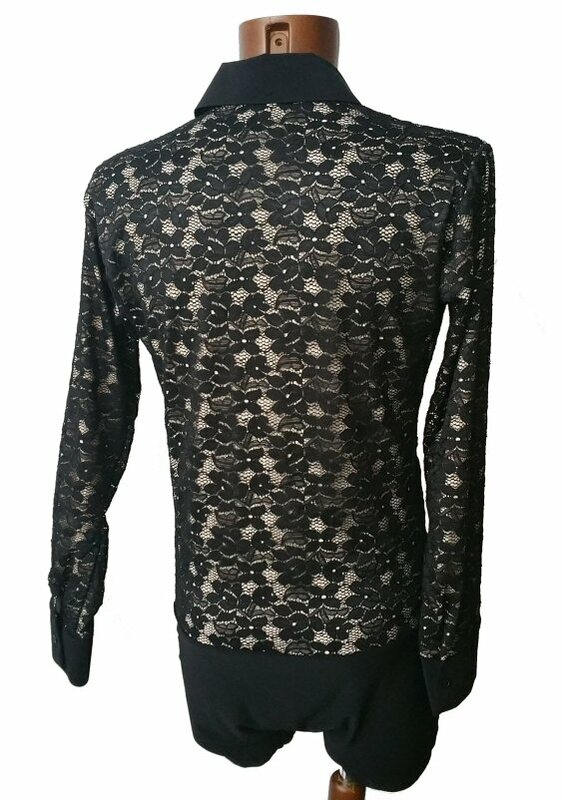 Black lace over Flesh underlay on front and back. Traditional collar and cuffs. Collar size goes in proportion with the body size. 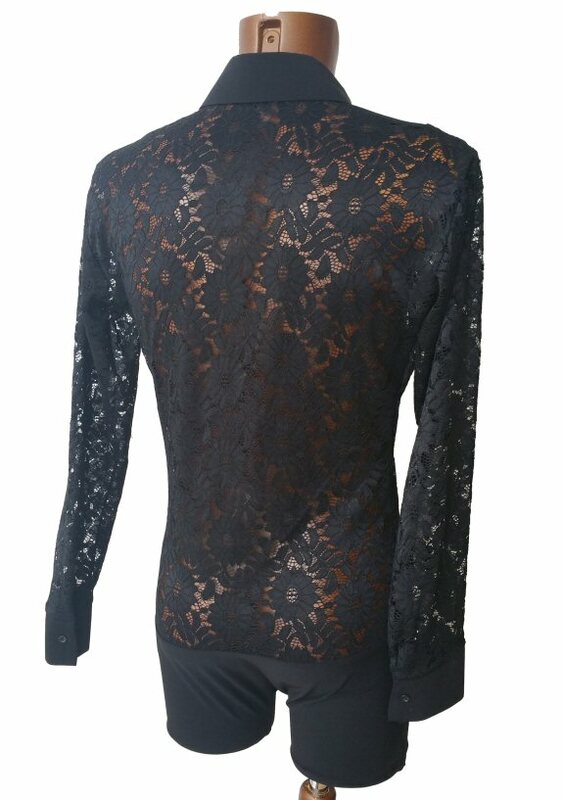 Semi-see through lace fabric on the sleeves, the back and body sides. 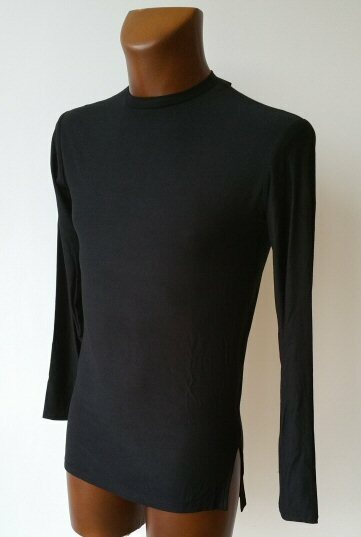 Solid black stretch crepe on the front. Traditional collar, buttons and button cuffs. 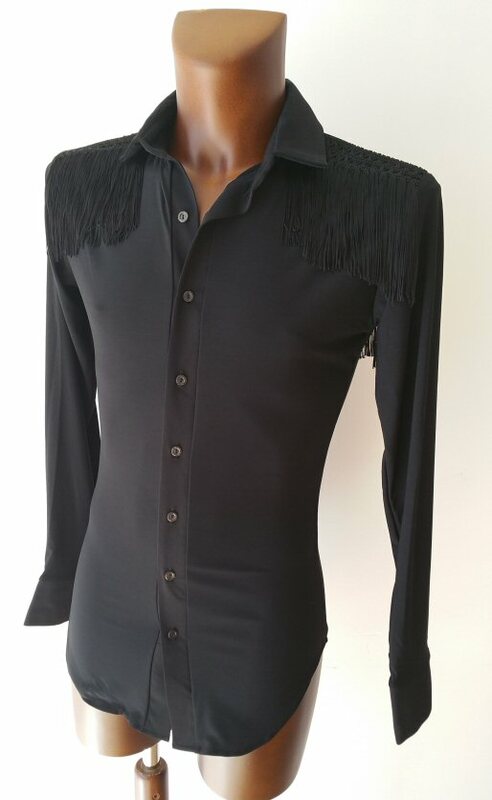 The collar size goes in proportion with the body size and it is slightly larger, but this type of shirt is best worn with top button open, so you do not need an exact collar size. This shirt is built on boxer shorts, so it will never pull out of your trousers. 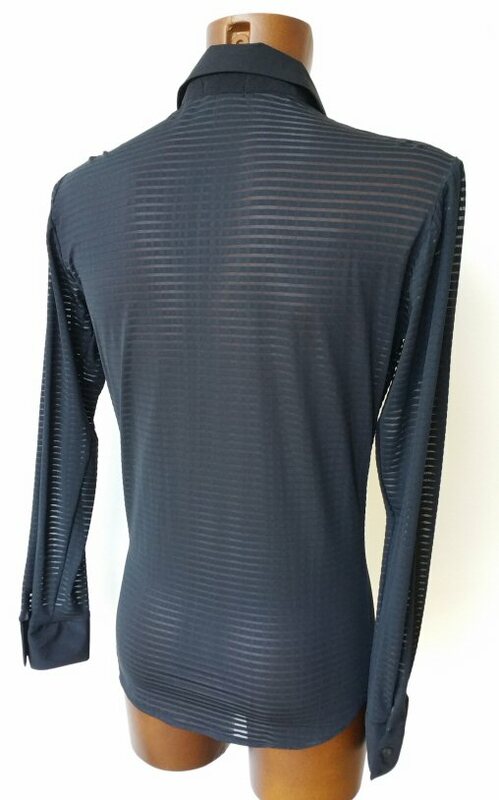 Semi-see through stripe fabric on the sleeves, the back and body sides. 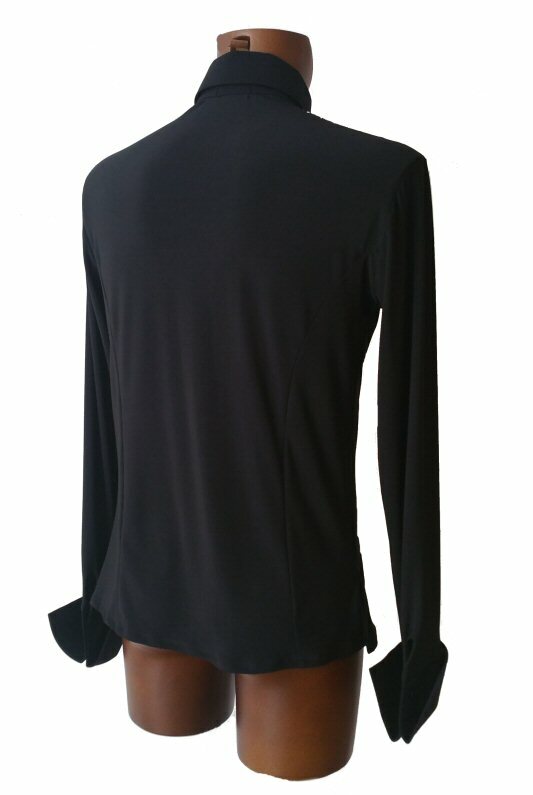 Solid black stretch crepe on the front. 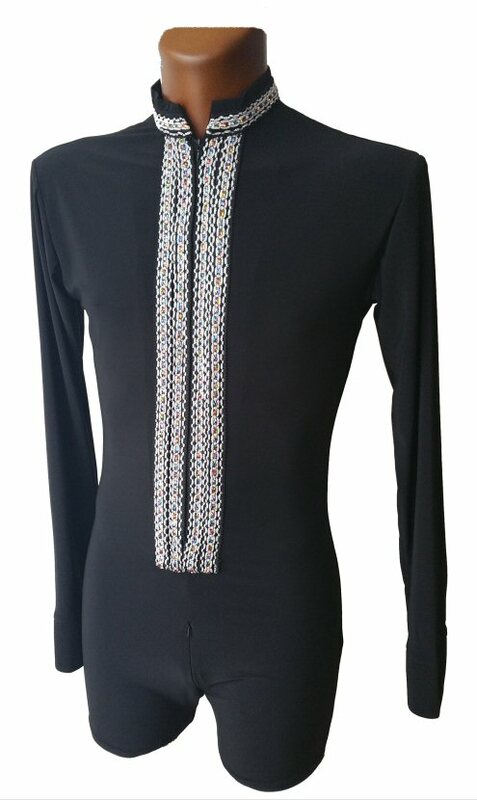 Traditional collar, buttons and button cuffs. 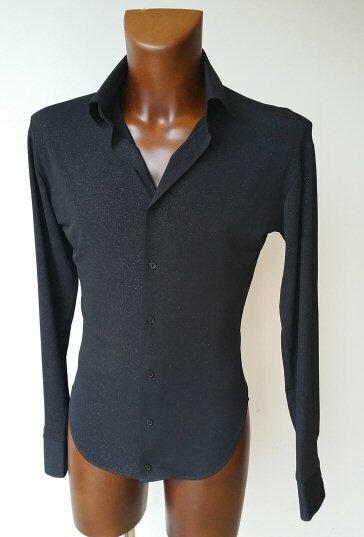 The collar size goes in proportion with the body size and it is slightly larger, but this type of shirt is best worn with top button open, so you do not need an exact collar size. 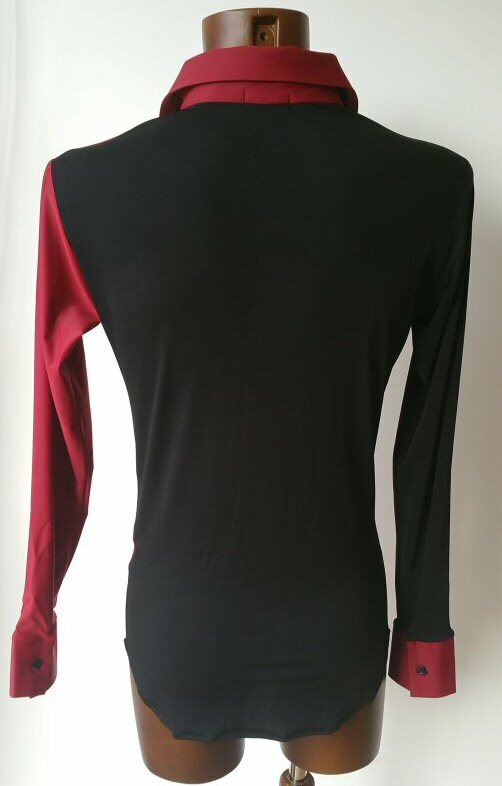 This is a shirt only, no underpants built-in. 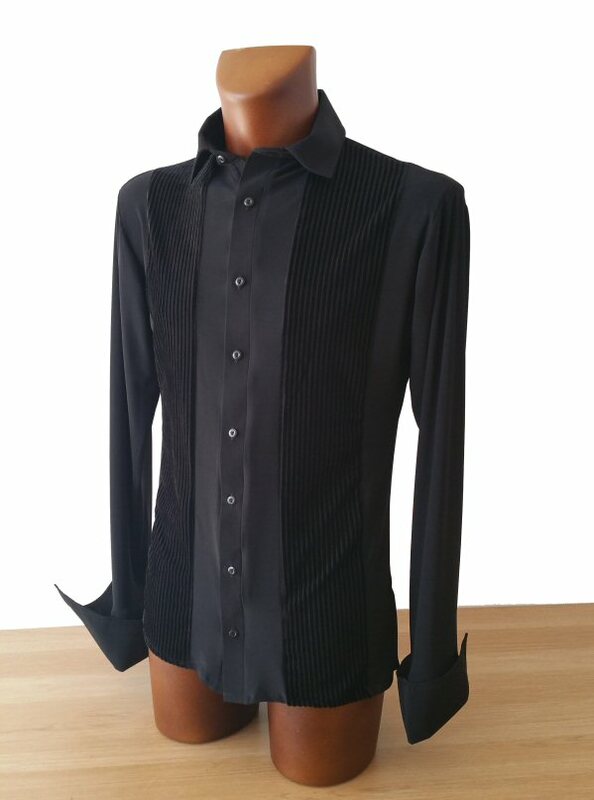 Semi-see through stripe fabric on the sleeves, the back and body sides. 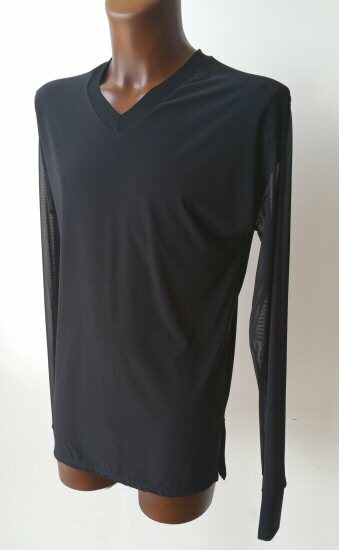 Solid black stretch crepe on the front. Traditional collar, buttons and button cuffs. 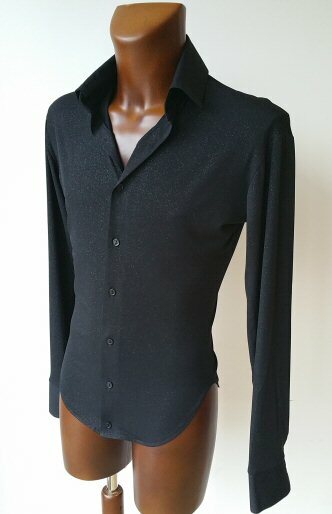 The collar size goes in proportion with the body size and it is slightly larger, but this type of shirt is best worn with top button open, so you do not need an exact collar size. This shirt is built on boxer shorts, so it will never pull out of your trousers. 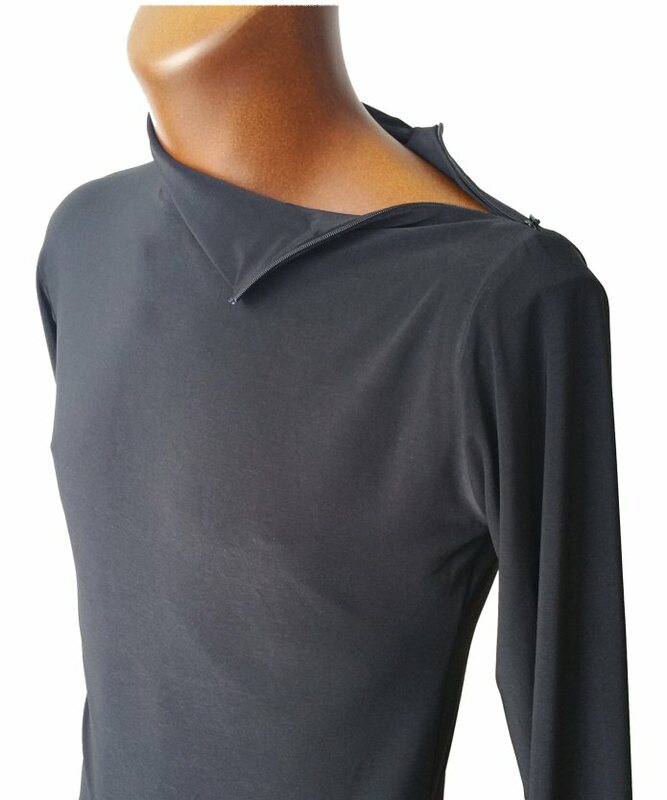 Contemporary, multi-purpose top made in stretch crepe. The sizes are given below when the fabric is completely unstretched. Every size will stretch by up to 2 inch. 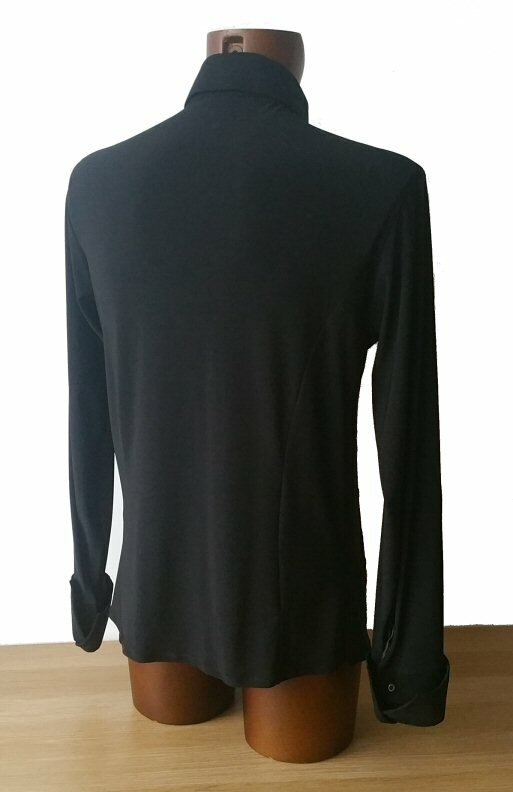 Ultra soft, round neck, loose practice top made in stretch cotton. Not only for dancing, but also for many other fitness routines and exercises. The sizes are given below when the fabric is completely unstretched. Every size will stretch by up to 3 inch. 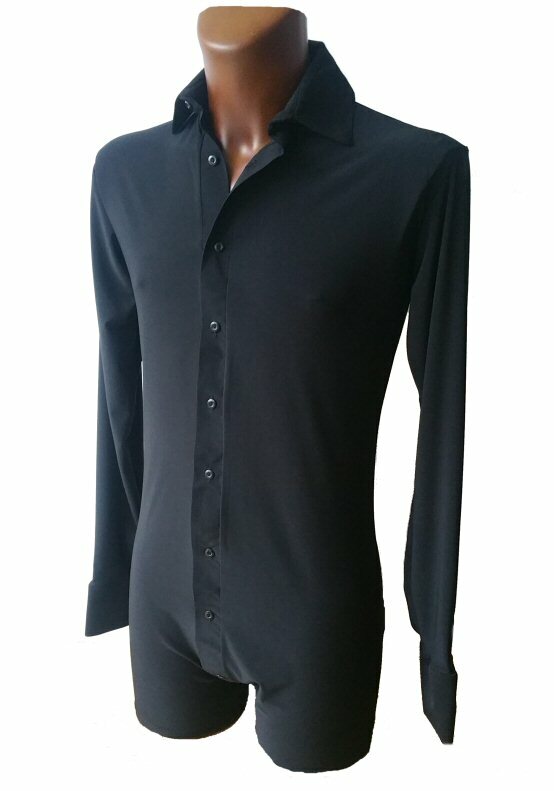 Stretch crepe shirt built on boxer shorts, which will never pull out of your trousers. 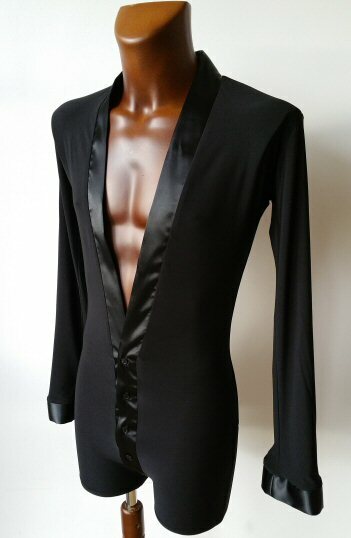 Satin edging around neck, front and sleeves. 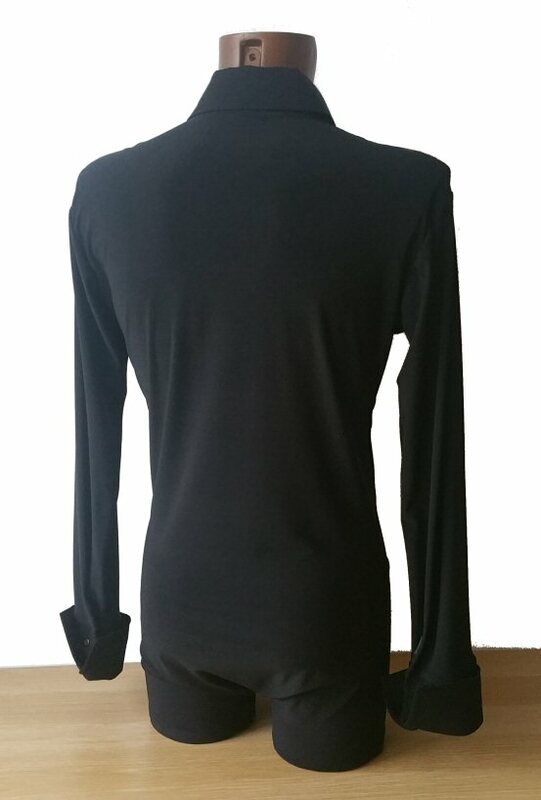 Bell shaped sleeves. 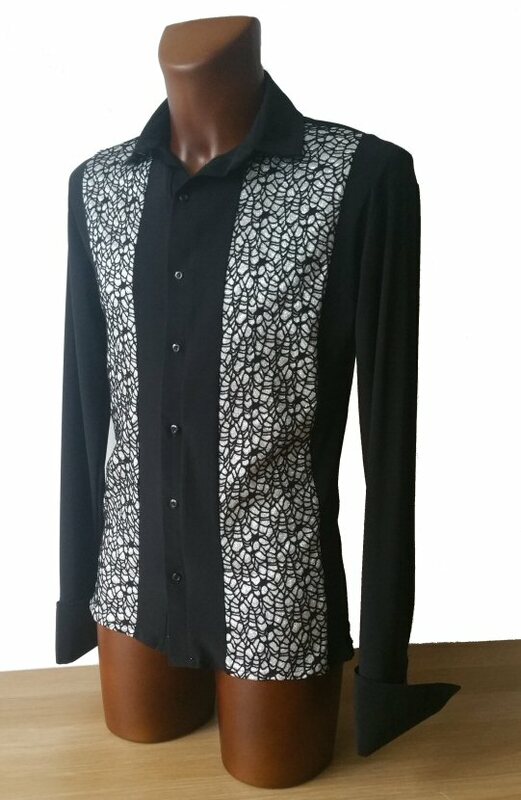 Apart from standard stock sizes this shirt can be made to your own size for £10.00. surcharge. 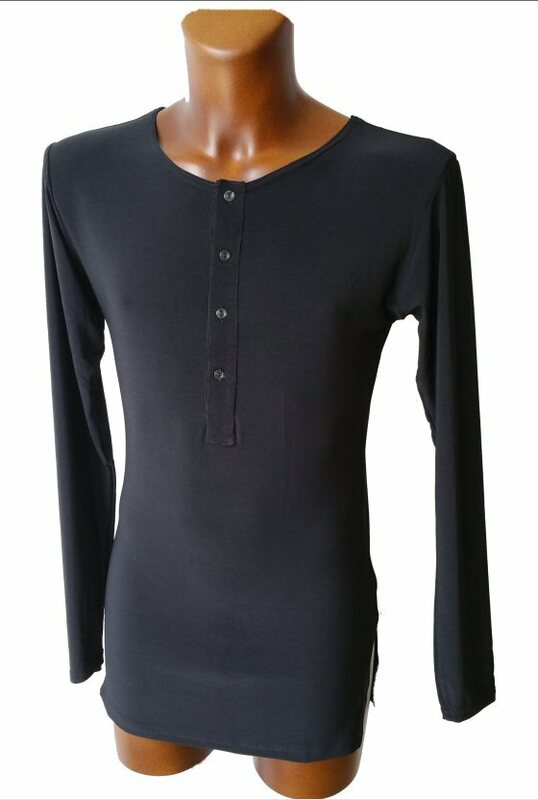 Just select "custom size" in the size selection box and send us your: collar size, chest size, waist size, length of sleeve measured from armpit to the wrist. 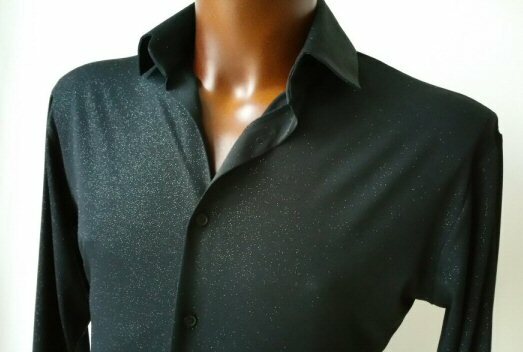 This shirt is made of unique stretchy fabric with tiny black dots which reflect light. It looks black at the day time, but comes alive under artificial light. 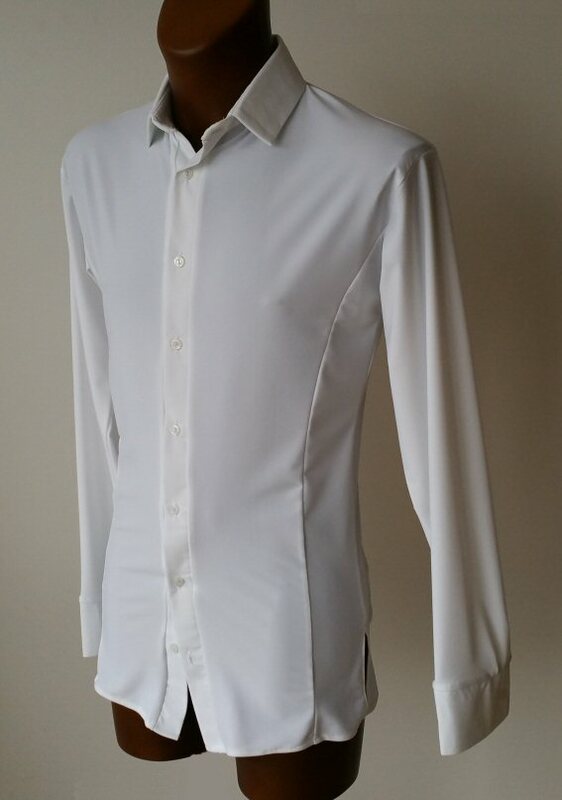 This is a full body shirt built on boxer shorts, so it will never pull out off your trousers. 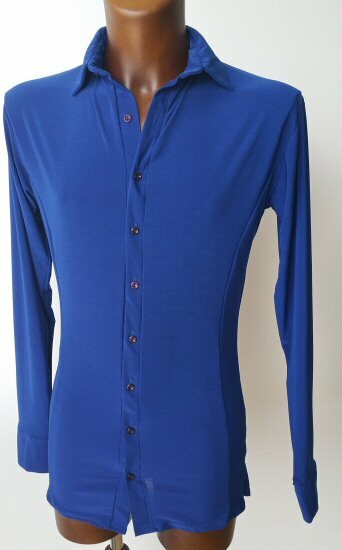 Apart from standard stock sizes this shirt can be made to your own size for £13.00. surcharge. 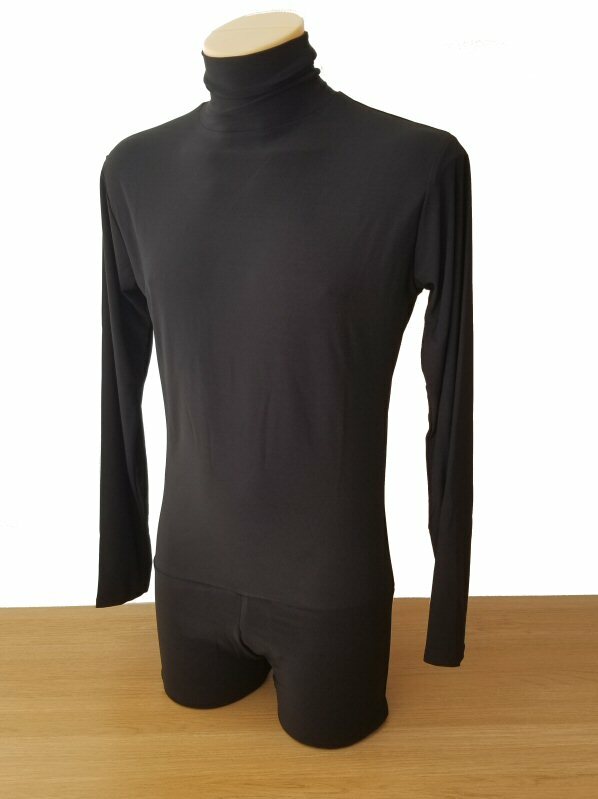 Just select "custom size" in the size selection box and send us your: collar size, chest size, waist size, length of sleeve measured from armpit to the wrist. 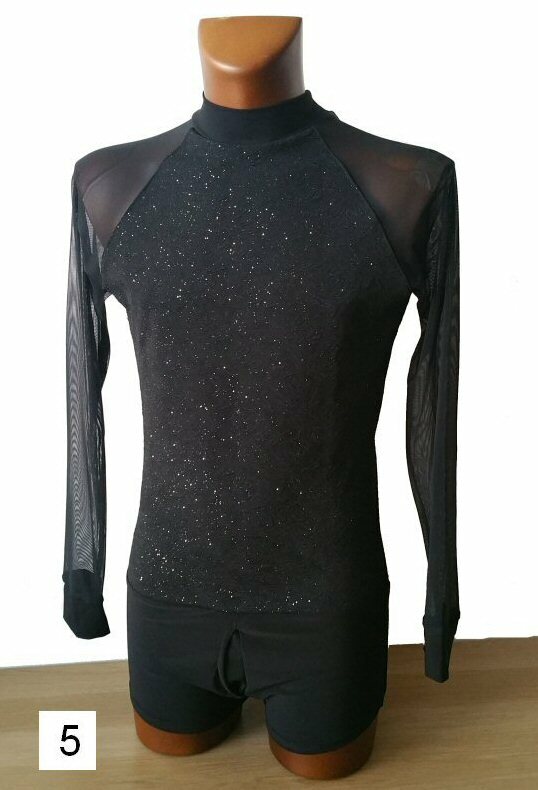 This shirt is made of unique stretchy fabric with tiny black dots which reflect light. It looks black at the day time, but comes alive under artificial light. 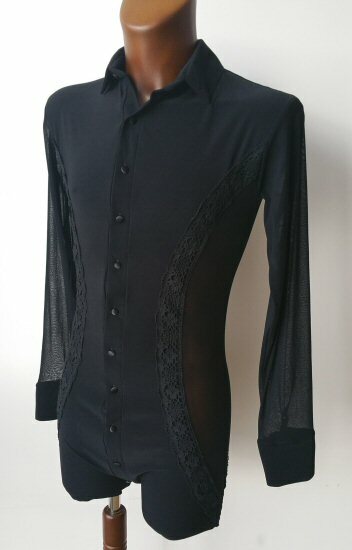 This is a shirt only, with no underpants. It can be worn outside your trousers. 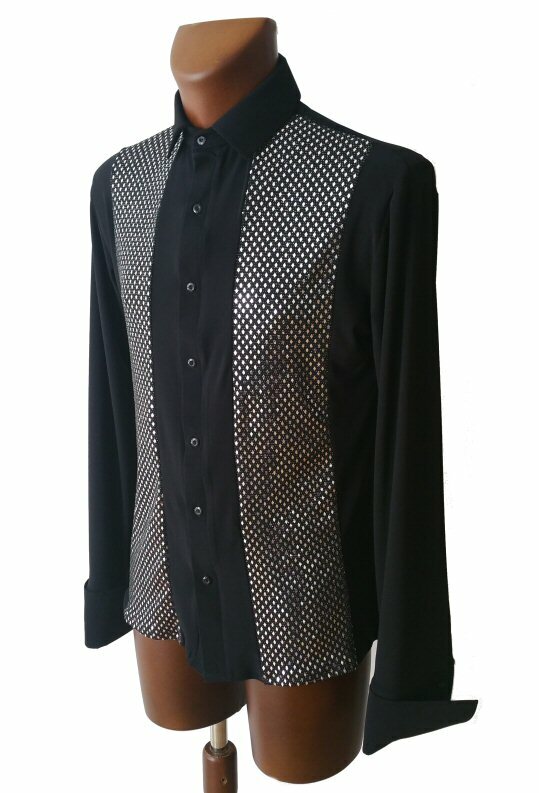 Soft, two way stretch crepe shirt with shiny sequin at the front. 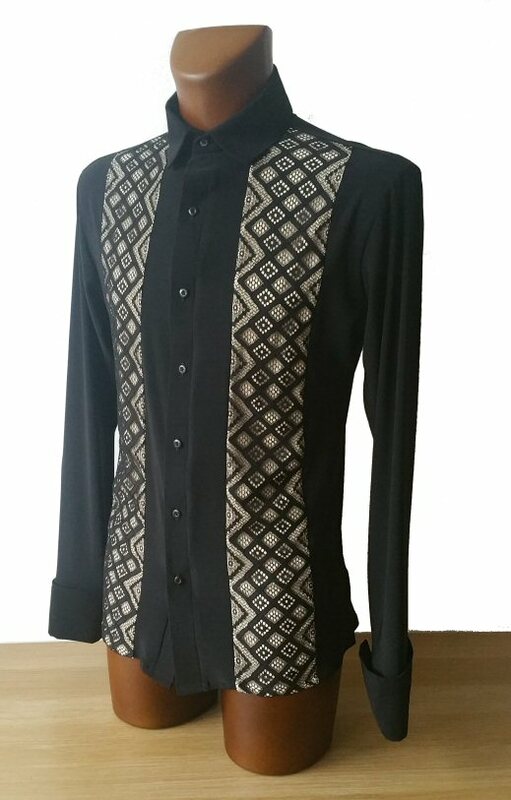 Traditional collar and buttons. 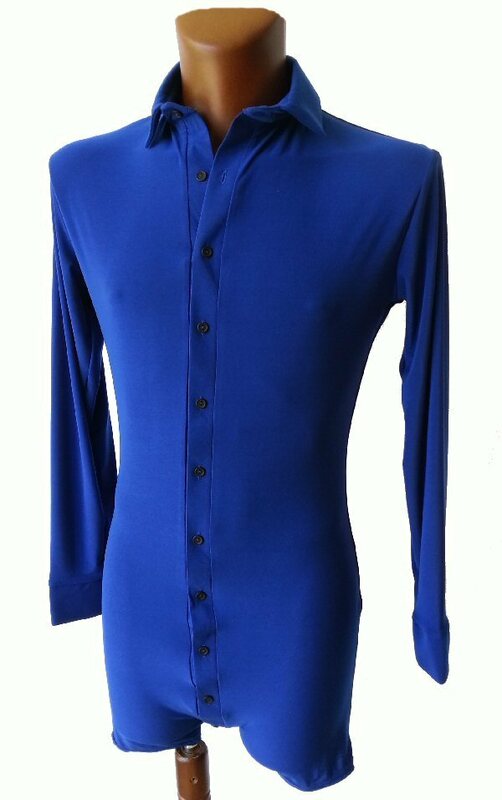 This is a shirt only, with no underpants. 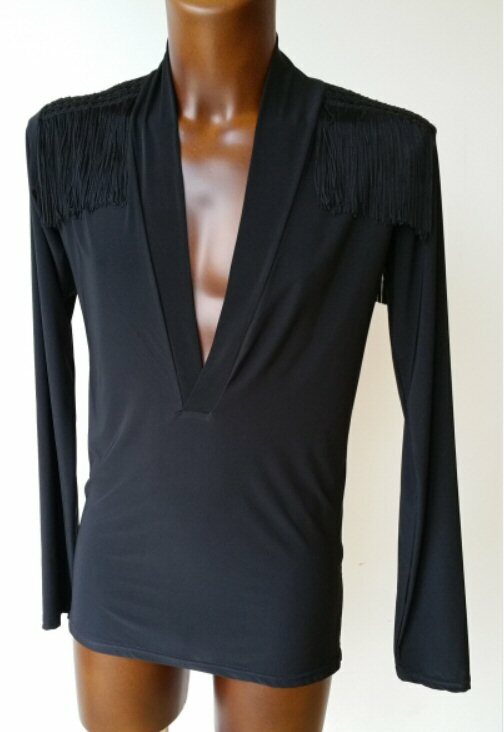 Available from Xtra Small to Xtra Large, but it can also be Custom made to your sizes for £12.00 surcharge. 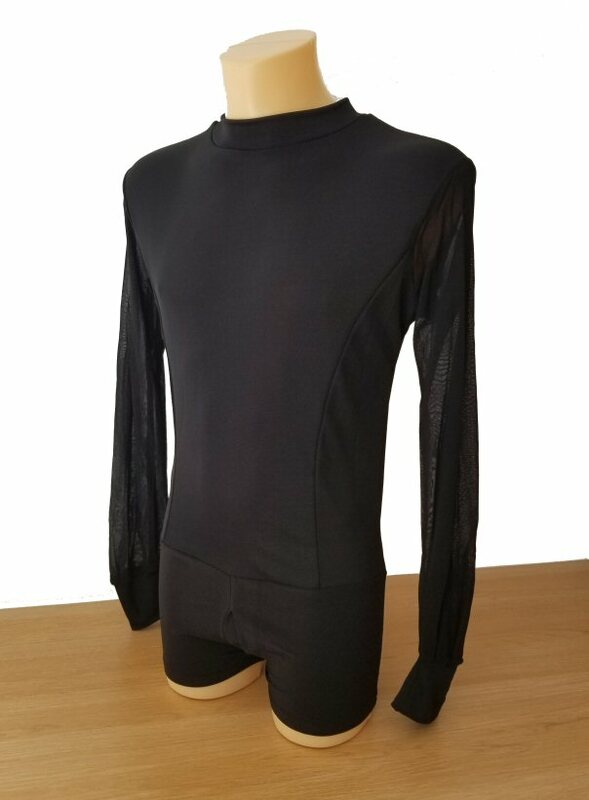 Just select "custom size" in the size selection box and send us your measurements: collar size, chest size, waist size, length of sleeve measured from armpit to the wrist. 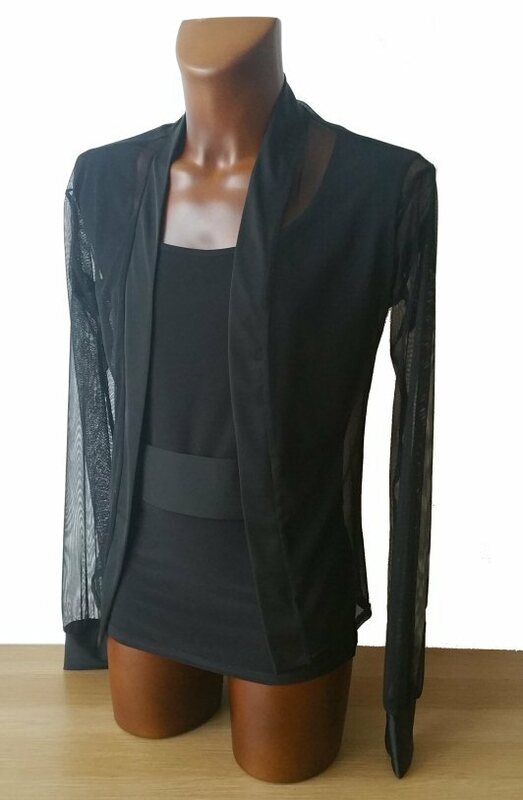 Soft, two way stretch crepe with stretchy mesh on side and lace enhancing your body lines. The is a full body shirt built on shorts, so it will never pull out from your trousers. Buttons at front. Soft, two way stretch crepe with stretchy mesh on side and lace enhancing your body lines. 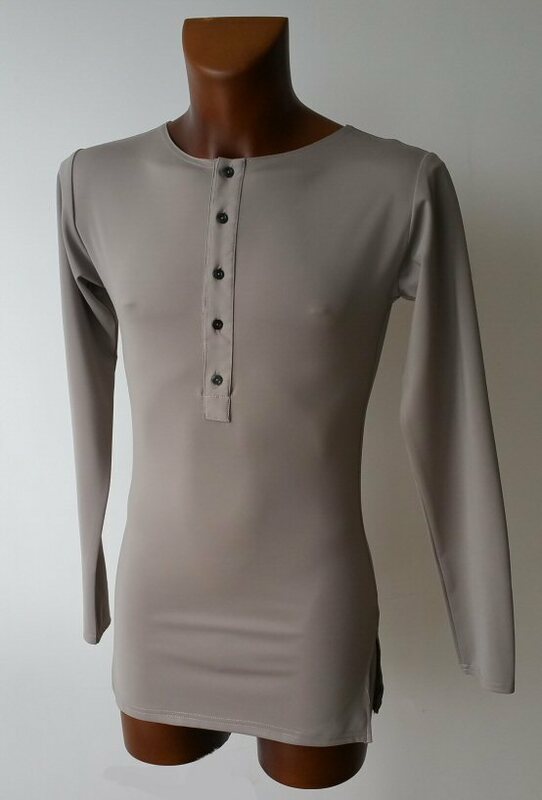 This is a shirt only, with no underpants. Buttons at front. Soft, two way stretch microfibre. The shirt is built on shorts, so it will never pull out from your trousers. Zip at front can be pulled up to the neck or lowered to any level you like. This is a full body shirt built on boxer shorts, so it will never pull out of your trosuers. Soft, two way stretch microfibre. The shirt is built on shorts, so it will never pull out from your trousers. Zip at front can be pulled up to the neck or lowered to any level you like. This is a full body shirt built on boxer shorts, so it will never pull out of your trosuers. Fly with zip built in. 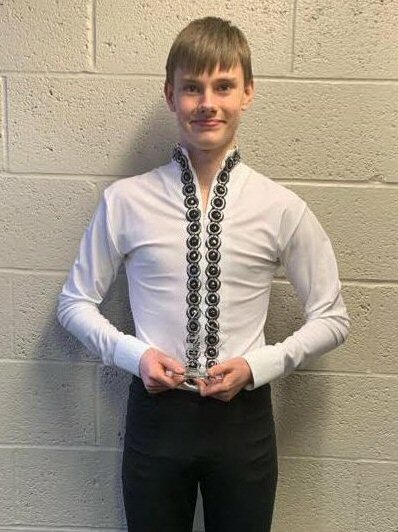 Xtra Small: Collar 15" - Chest 32" - Waist 28" - Sleeve 20.5"
Small: Collar 15.5" - Chest 34" - Waist 30" - Sleeve 20.5"
Medium: Collar 16" - Chest 36" - Waist 32" - Sleeve 21.5"
Large: Collar 16.5" - Chest 38" - Waist 34" - Sleeve 21.5""
Xtra Large: Collar 17" - Chest 40" - Waist 36" - Sleeve 22"
Soft, body friendly stretch crepe. Zip at front can be pulled up to the neck or lowered to any level you like. This is a full body shirt built on shorts, so it will never pull out of your trosuers. Soft, two way stretch microfibre. The shirt is built on shorts, so it will never pull out from your trousers. Zip at front can be pulled up to the neck or lowered to any level you like. This is a full body shirt built on shorts, so it will never pull out of your trosuers. Soft, body friendly stretch crepe. 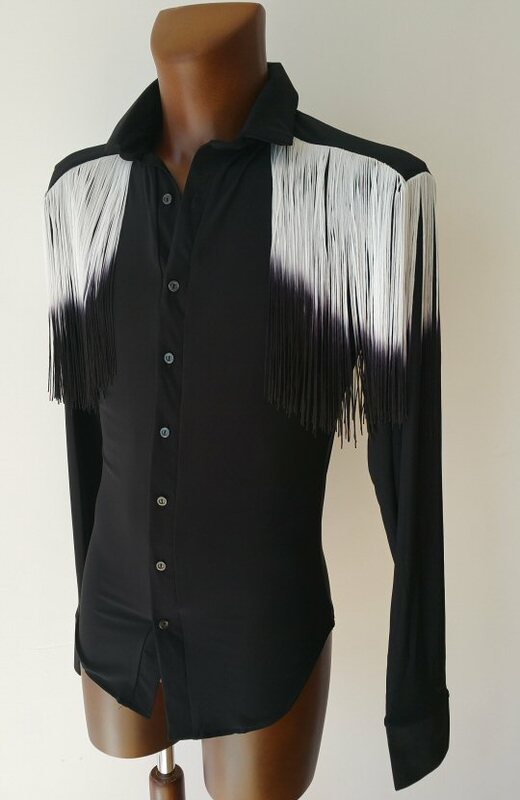 White shaded fringe on shoulders with traditional collar, buttons and button cuffs. 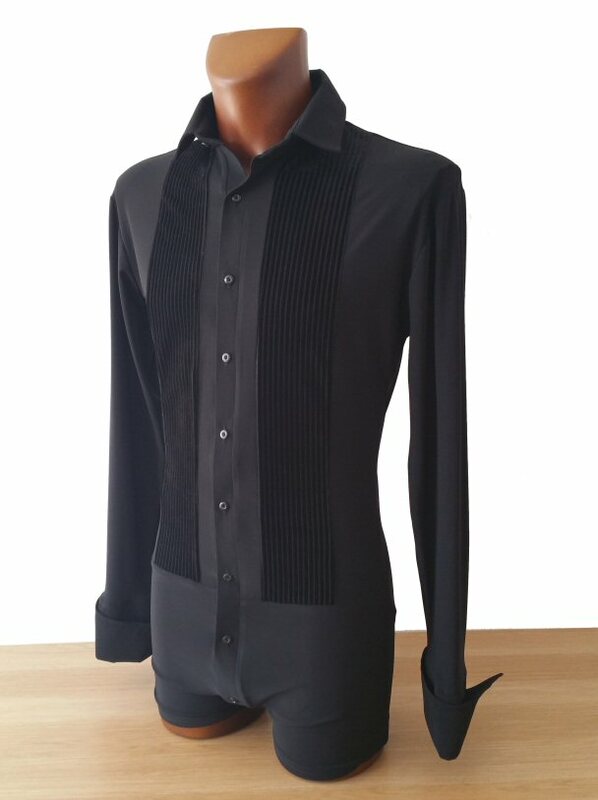 The collar size goes in proportion with the body size and it is slightly larger, but this type of shirt is best worn with top button open, so you do not need an exact collar size. 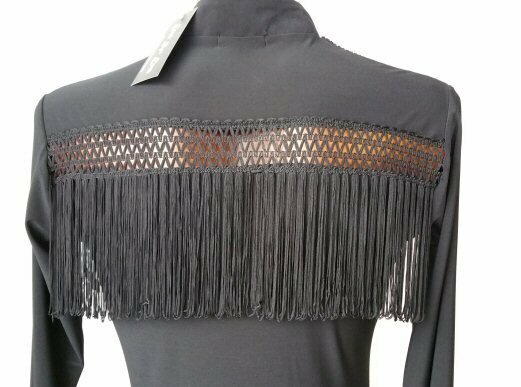 If you find the fringe too long you can cut it to any length you like using ordinary scissors. Soft, body friendly stretch crepe. 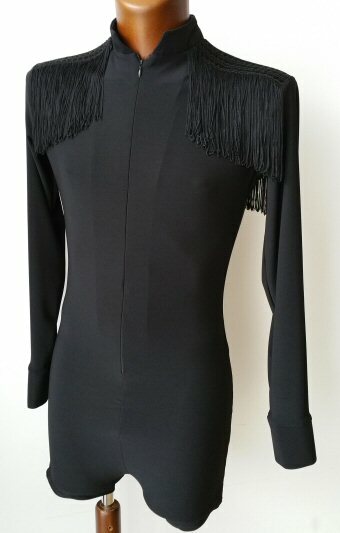 Black fringe on shoulders with traditional collar, buttons and button cuffs. 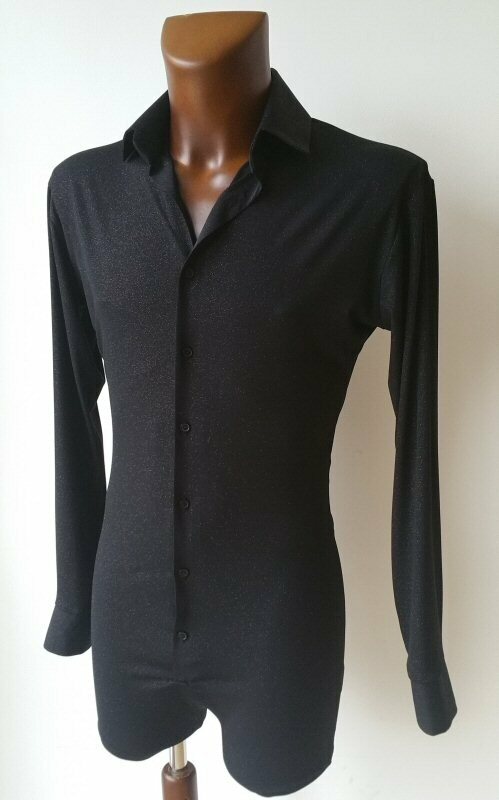 The collar size goes in proportion with the body size and it is slightly larger, but this type of shirt is best worn with top button open, so you do not need an exact collar size. 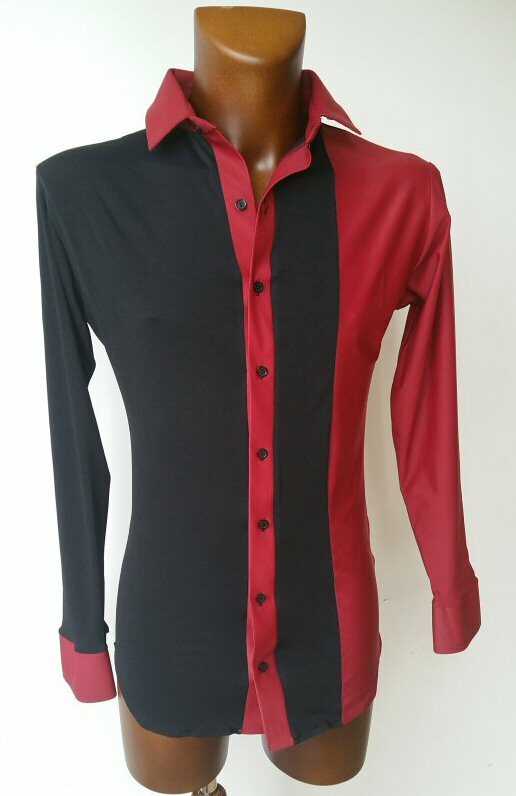 Classic cut and two tone Black / Dark Red combination. This is a shirt only, no underpants. Classic cut and two tone Black / Graphite Grey combination. This is a shirt only, no underpants. 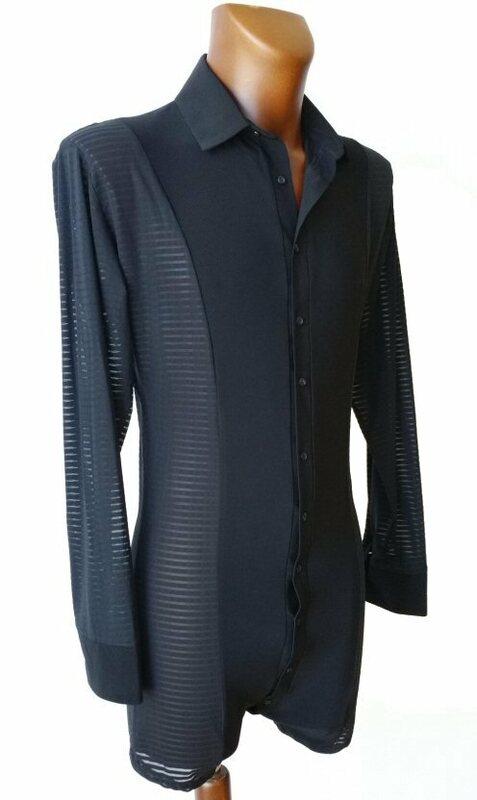 Soft, two way stretch crepe shirt with satin collar and stretch mesh on sides. 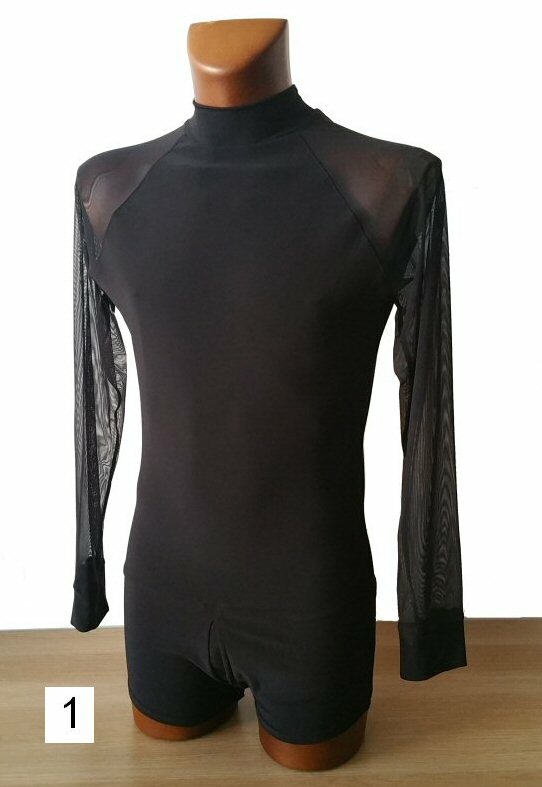 This is a shirt only, with no underpants. It can be worn outside your trousers. 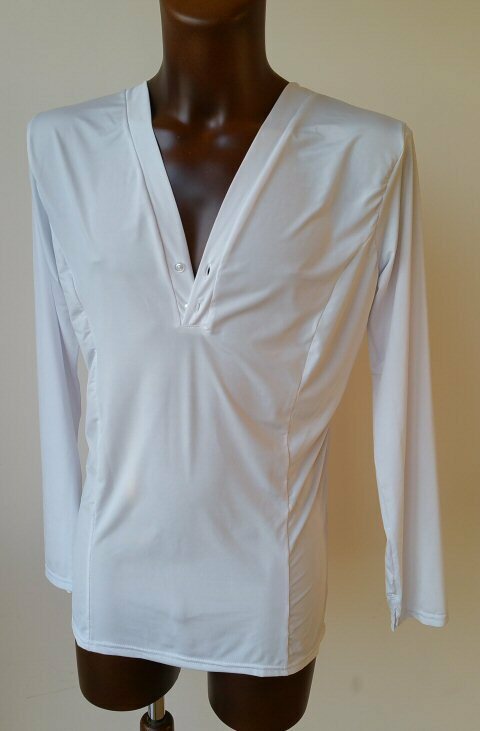 Soft, two way stretch crepe shirt with two buttons under the V-neck. This is a top only, with no underpants. 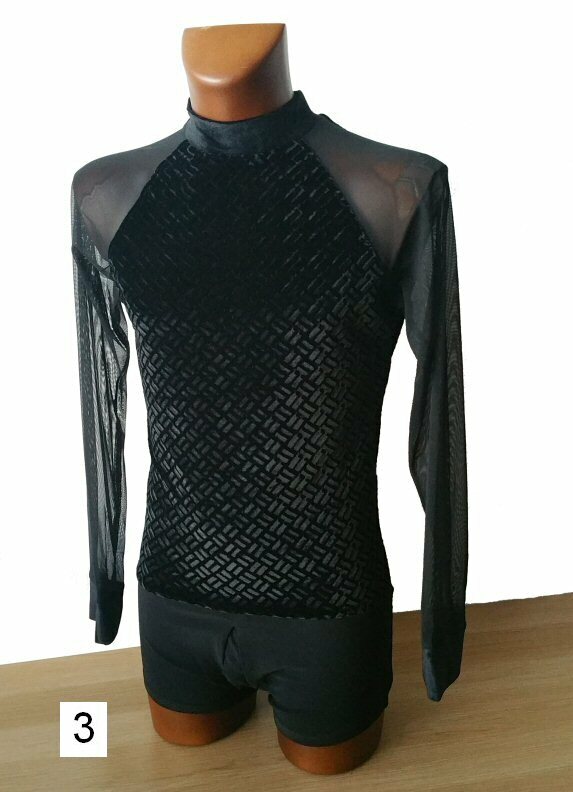 Two way stretch soft touch shirt with mesh sleeves. 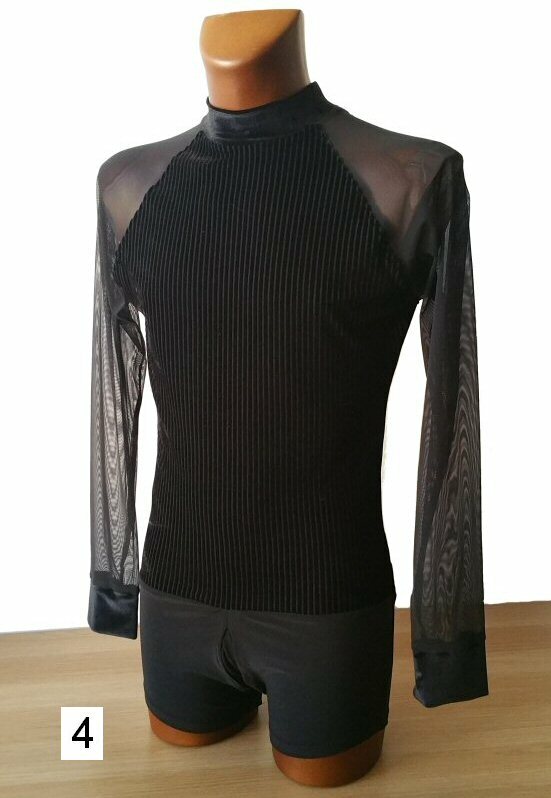 This is a top only, with no underpants. 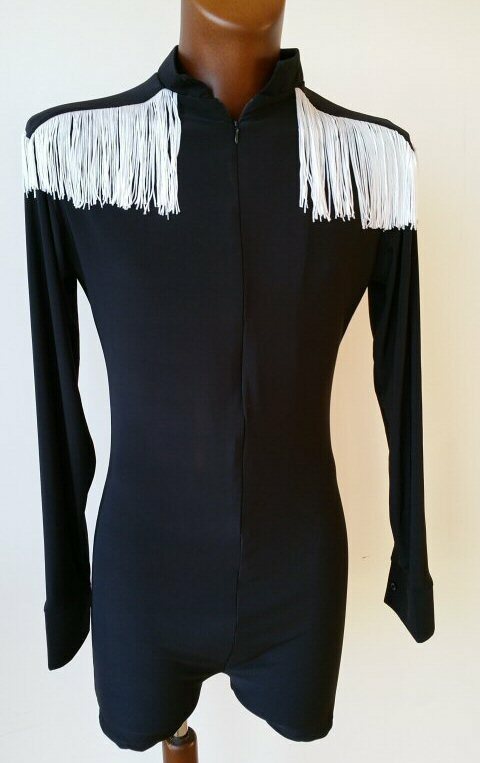 Soft, two way stretch crepe shirt with long V neck and black fringe on shoulders and at the back. 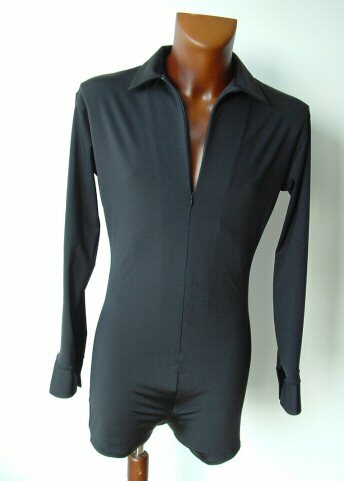 This is a shirt only, with no underpants. 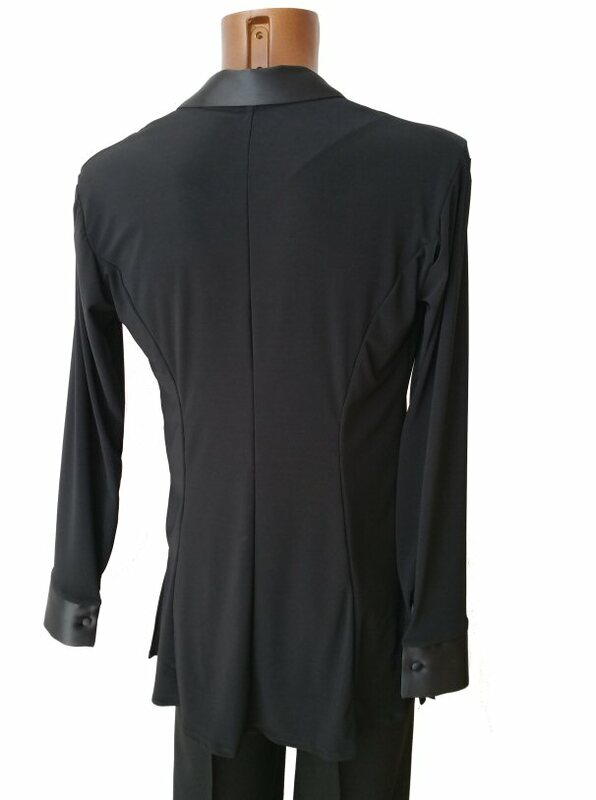 Soft, two way stretch microfibre shirt with mesh sleeves and vertical mesh insert on the back. This is a top only, with no underpants. Soft, two way stretch microfibre. The is a full body shirt built on boxer shorts, so it will never pull out from your trousers. Soft, two way stretch microfibre. 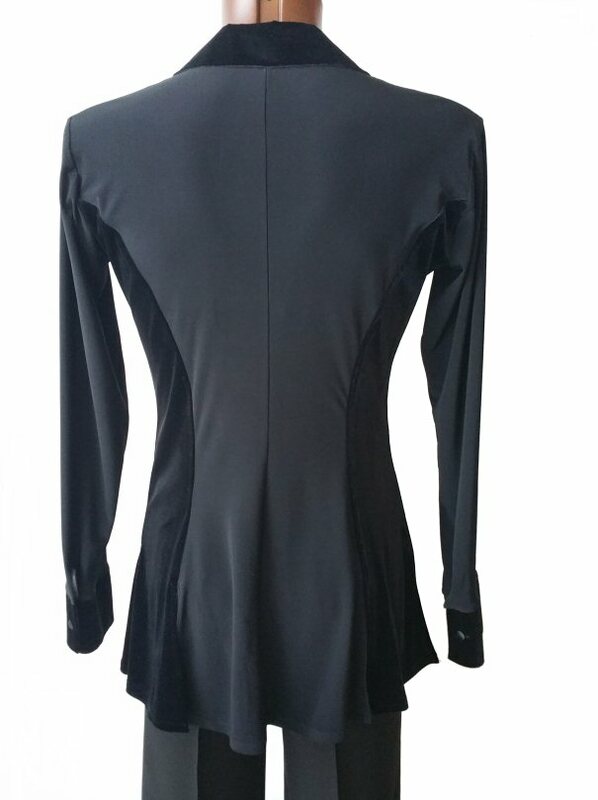 Zip at front allows you to zip it up to the neck or keep unzipped to any any hight you like. The shirt is built on boxer shorts, so it will never pull out from your trousers. 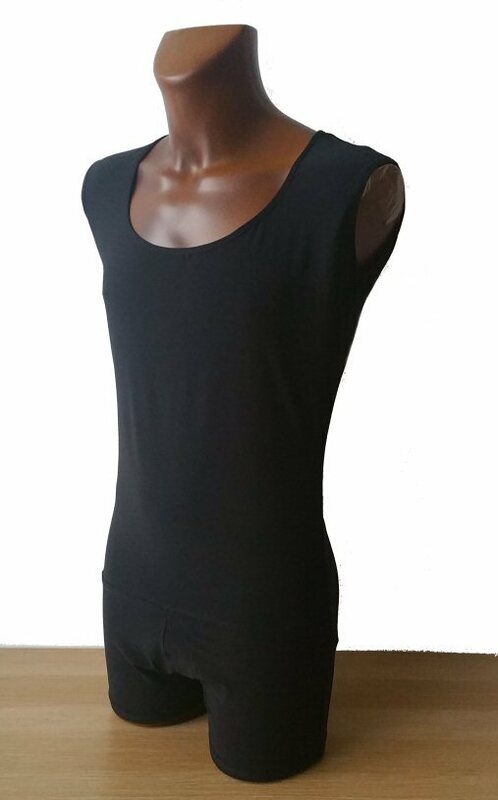 This practice top is made of cotton/lycra mix and is both very stretchy and sweat absorbing. 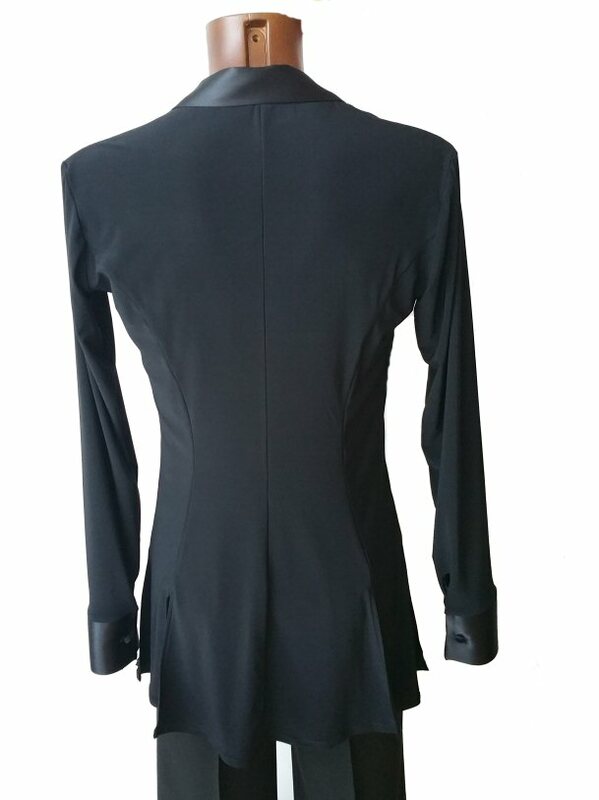 Two curved seams at front and at the back help to create perfect body lines. 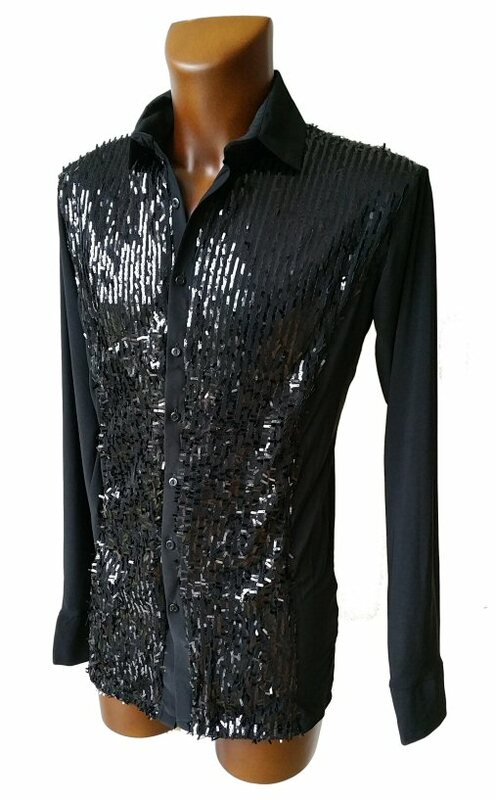 This shirt is made of Elvis stretchy fabric, which gives illusion of being a soft leather, but it is a fabric! 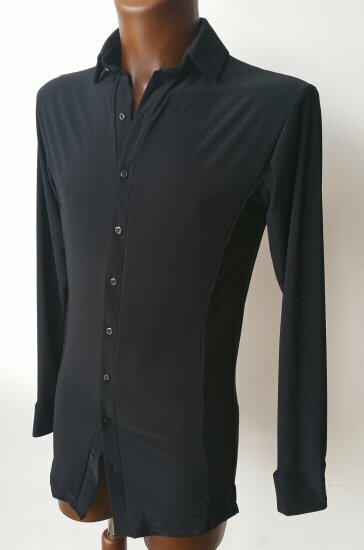 This is a full body shirt built on boxer shorts, so it will never pull out from your trousers. Soft, two way stretch microfibre. The shirt is built on boxer shorts, so it will never pull out from your trousers. Soft and stretchy luxury crepe. 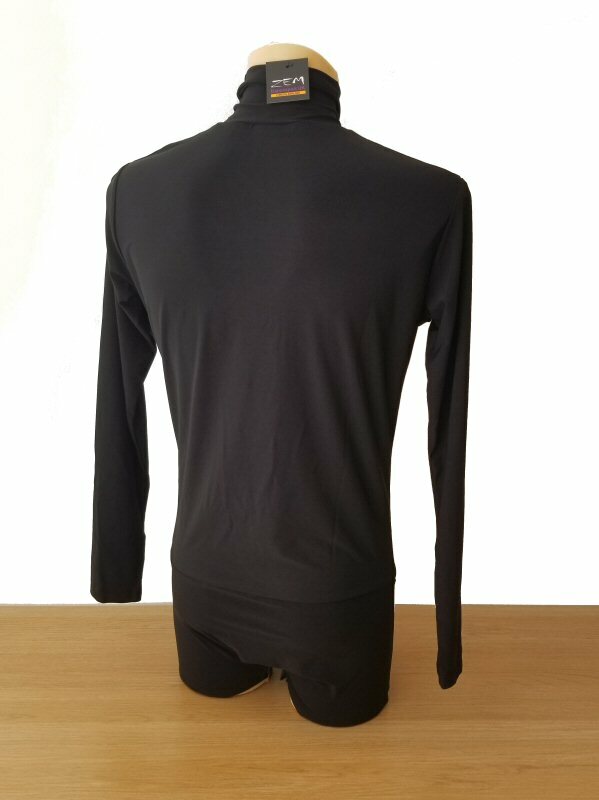 The sizing of Cappucino polo neck top is slightly smaller than in other colours due to cappucino fabric being thicker and less stretchy than the ones above. Sizes given in "Select size" box below.